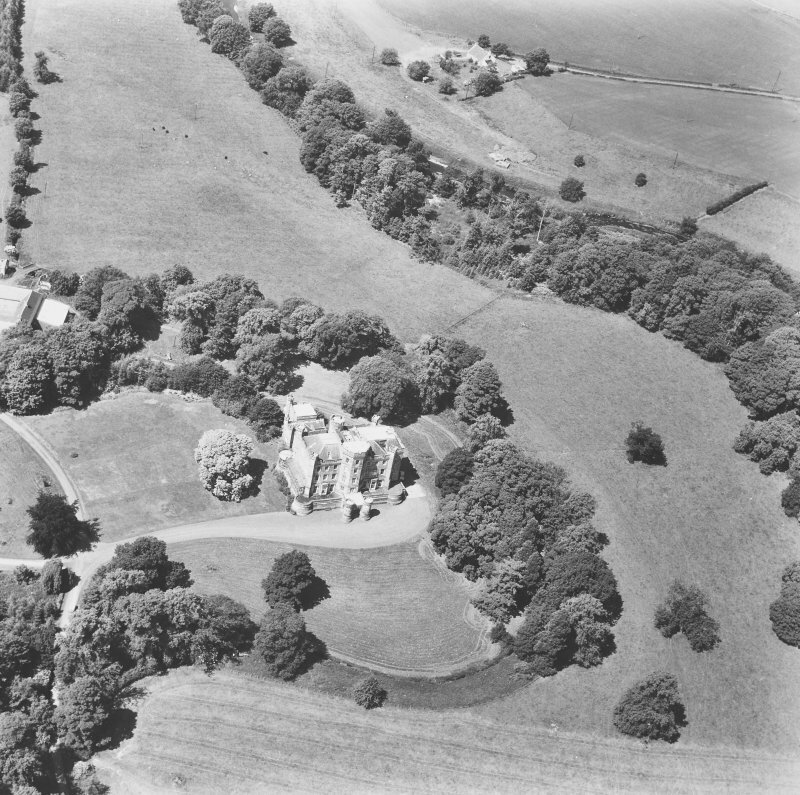 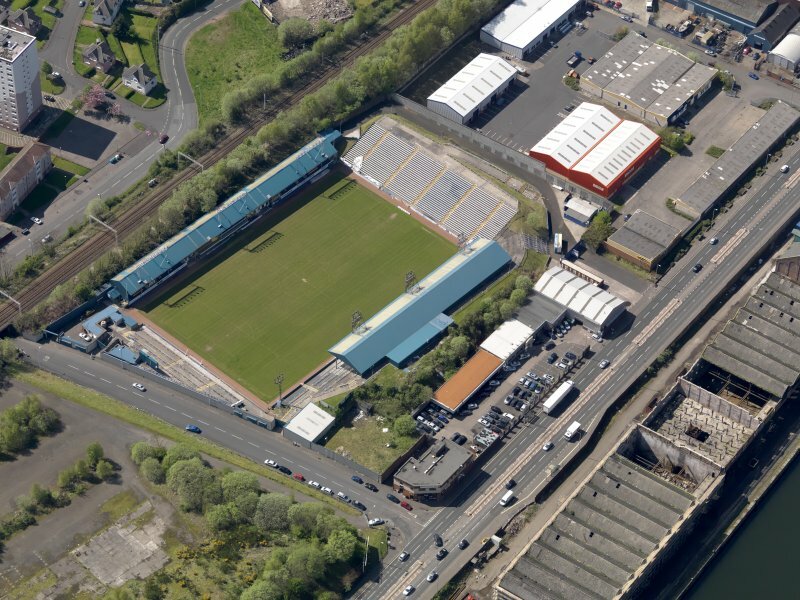 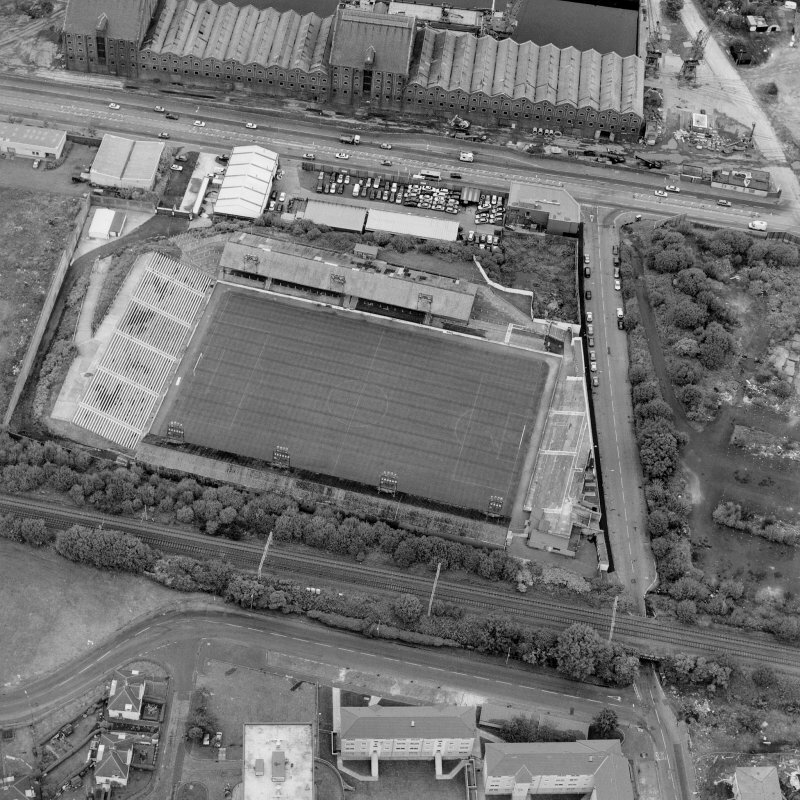 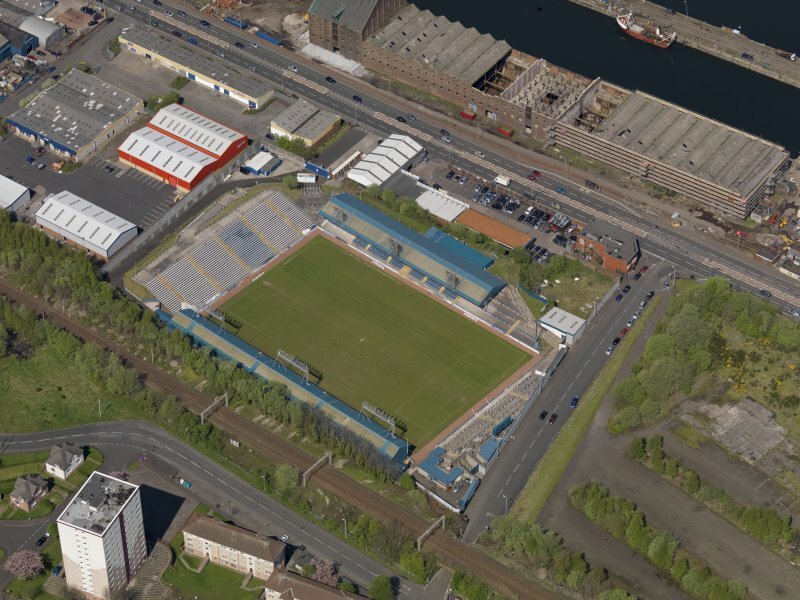 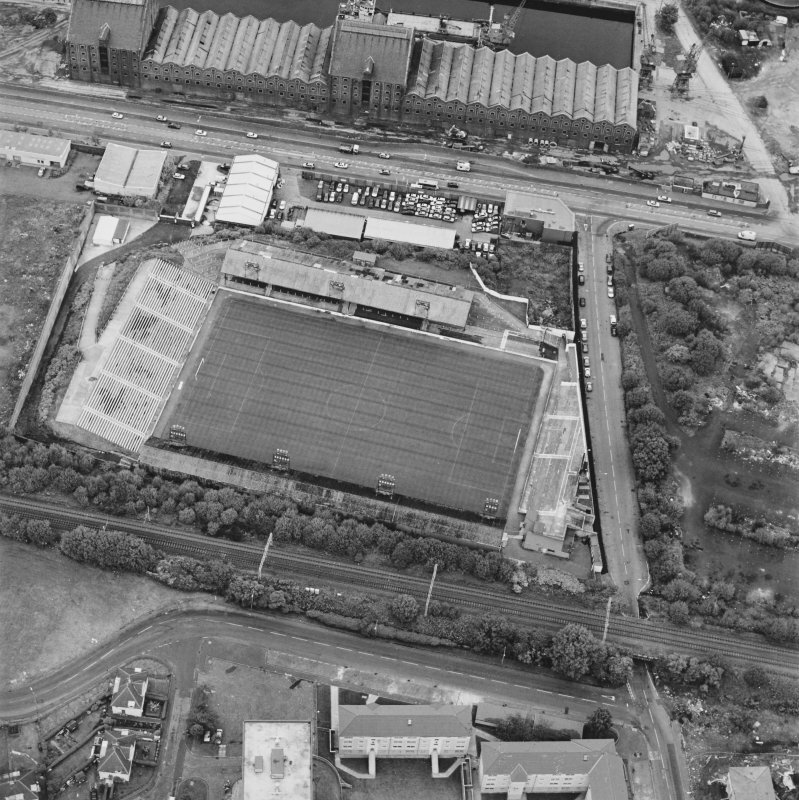 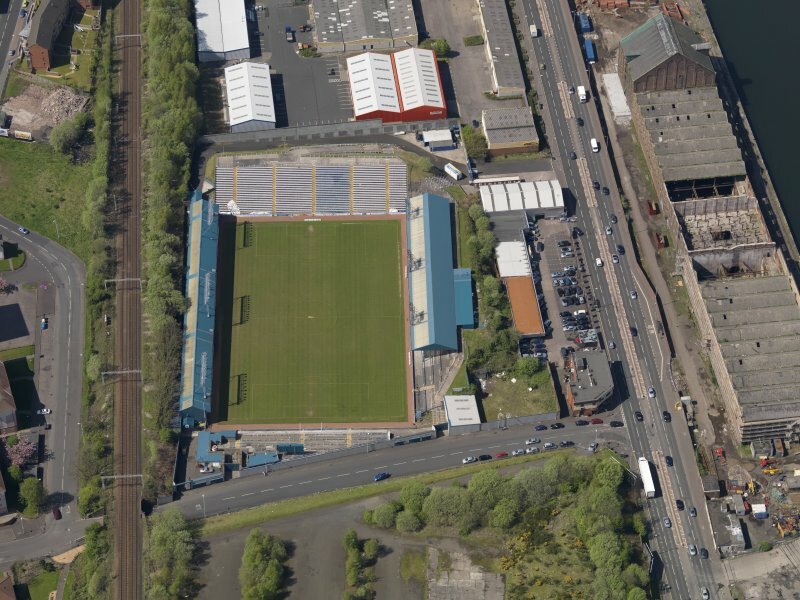 Oblique aerial view centred on the football ground, taken from the SE. 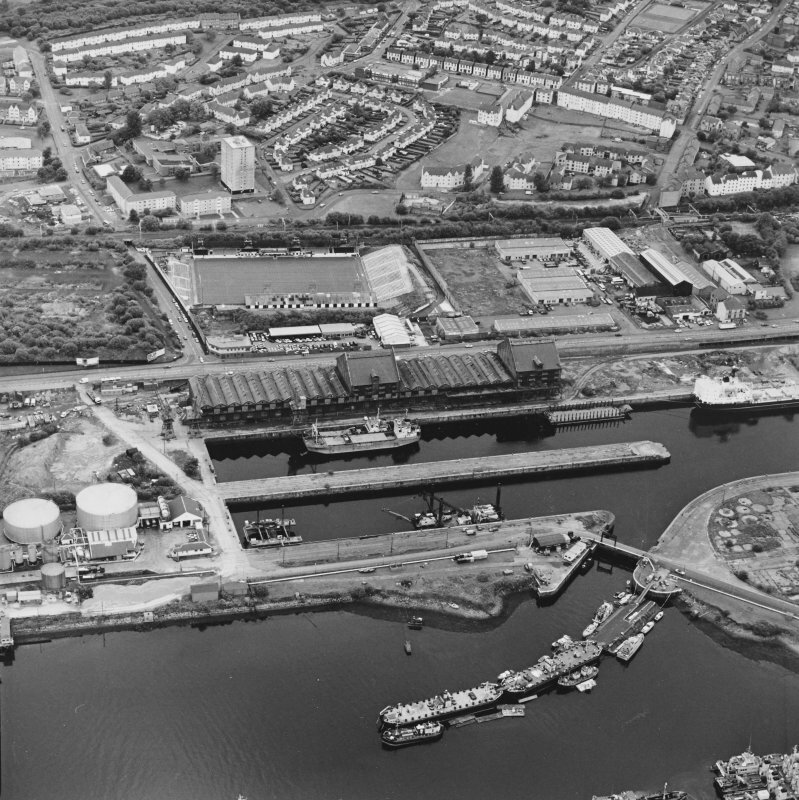 Oblique aerial view centred on the burnt out sugar warehouse and the docks, taken from the S.
Oblique aerial view centred on the burnt out sugar warehouse and the docks, taken from the WNW. 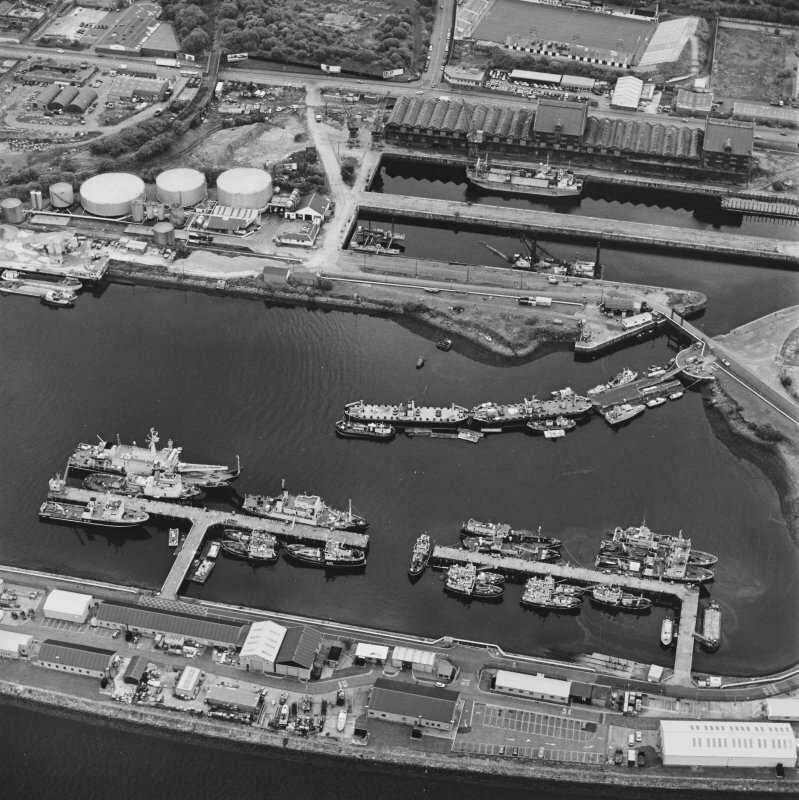 Oblique aerial view centred on the burnt out sugar warehouse and the docks, taken from the E.
Oblique aerial view centred on the burnt out sugar warehouse and the docks, taken from the ESE. 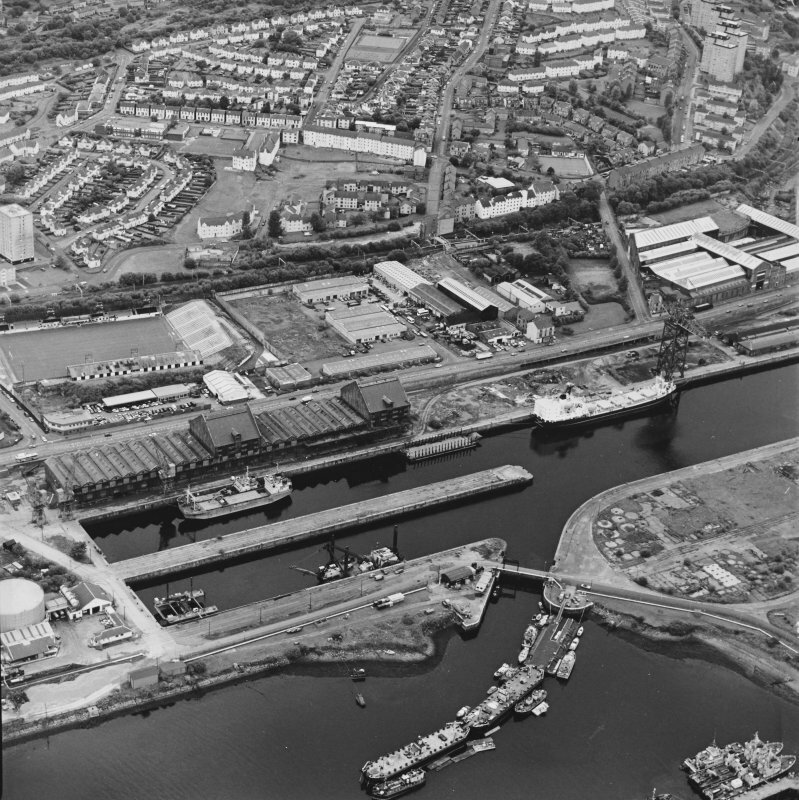 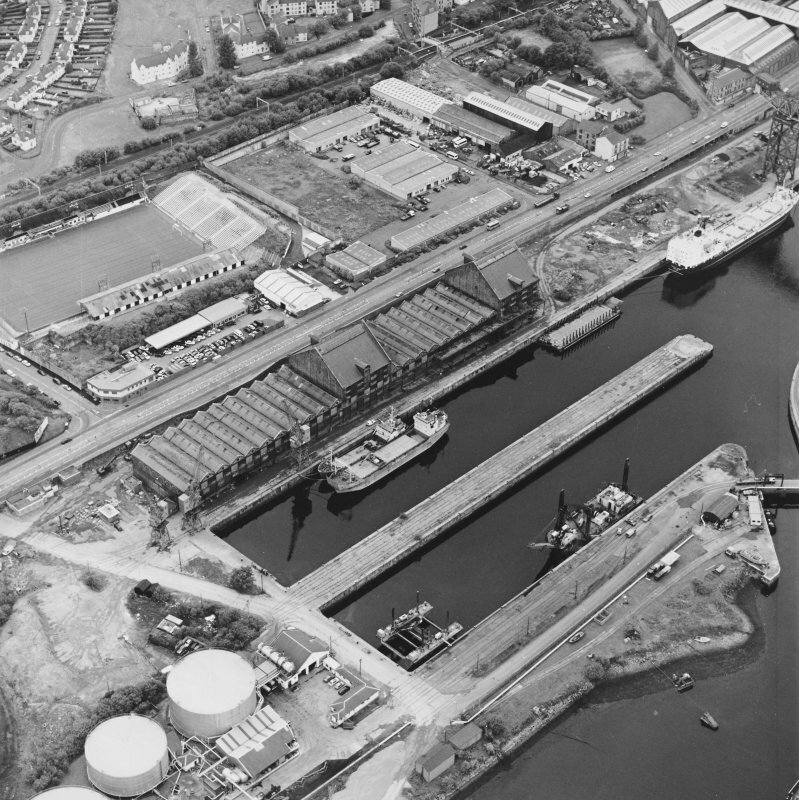 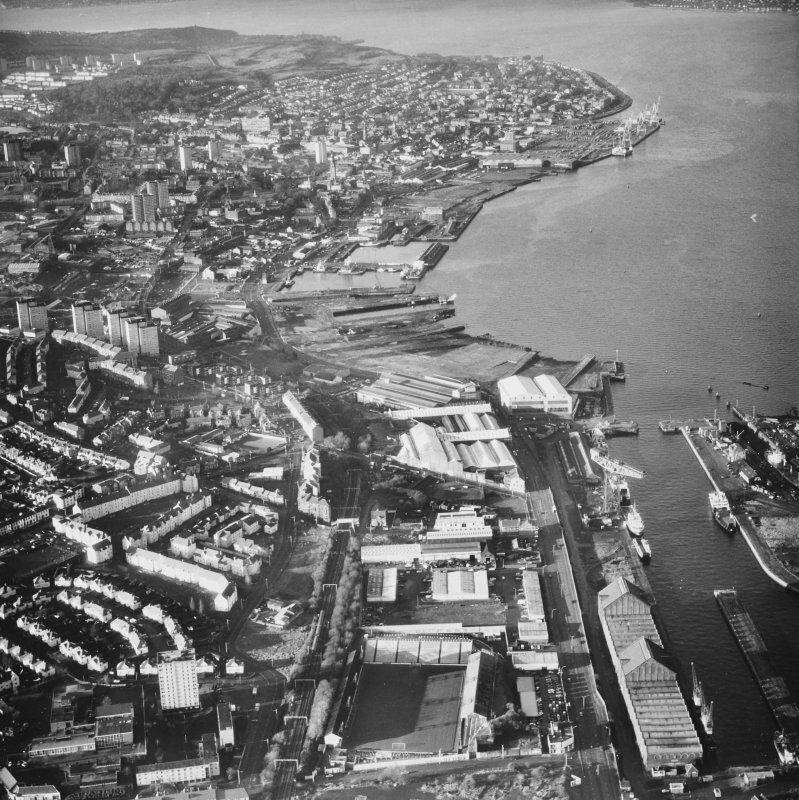 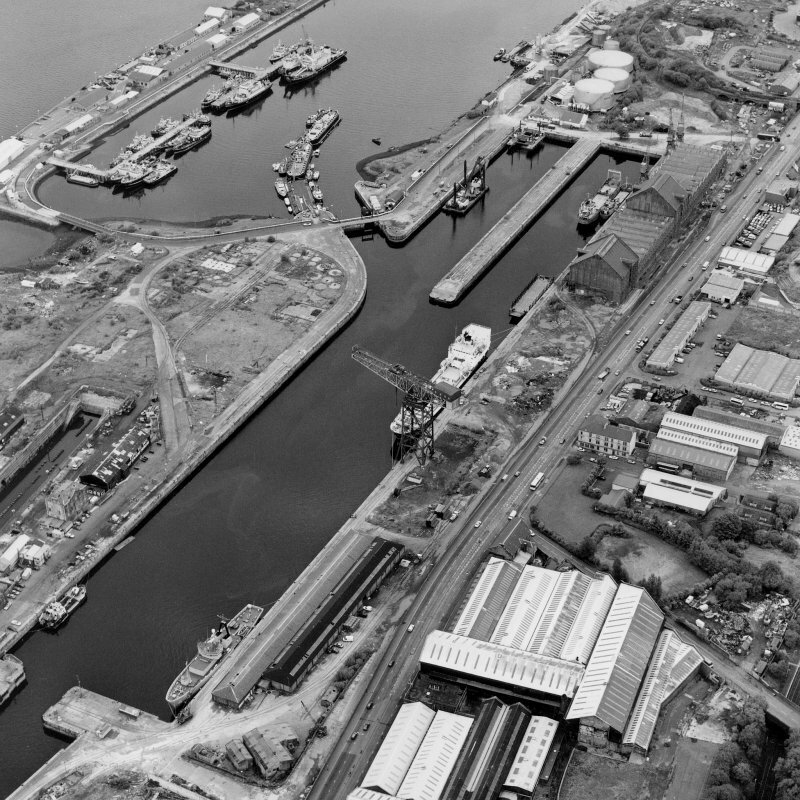 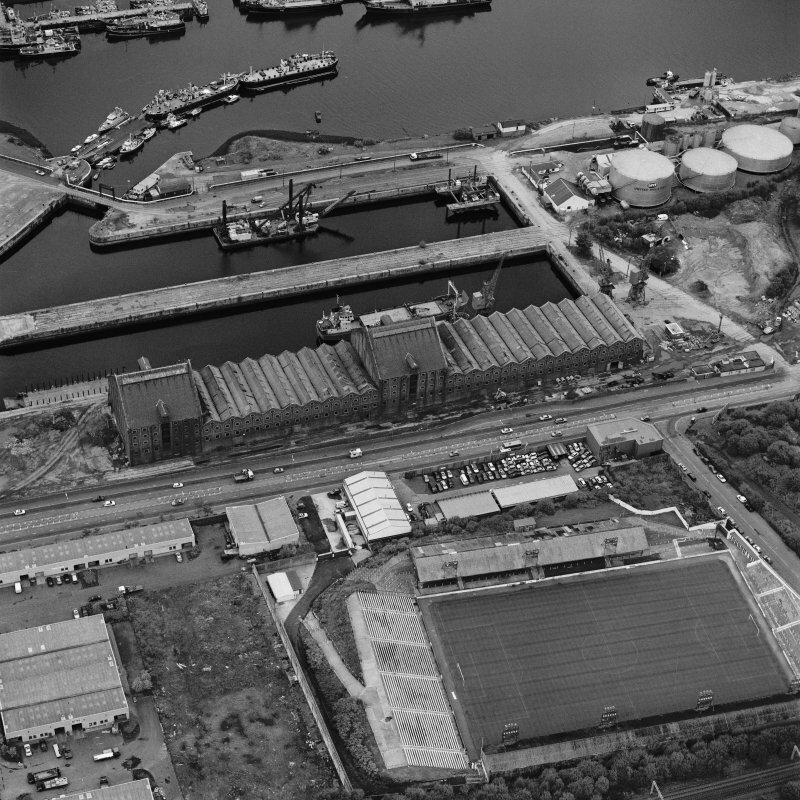 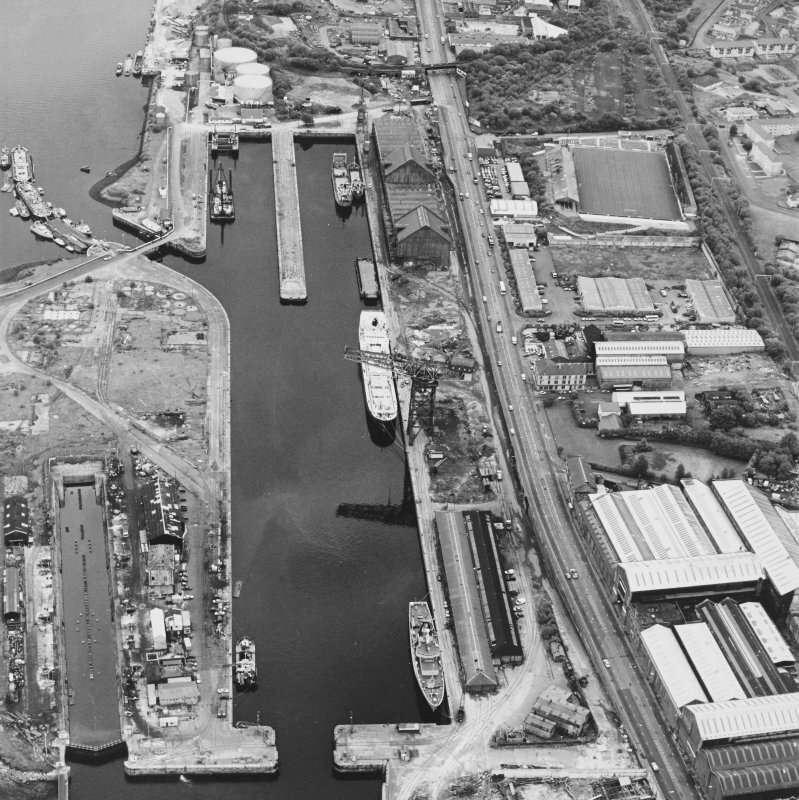 Oblique aerial view centred on the burnt out sugar warehouse and the docks, taken from the NNE. 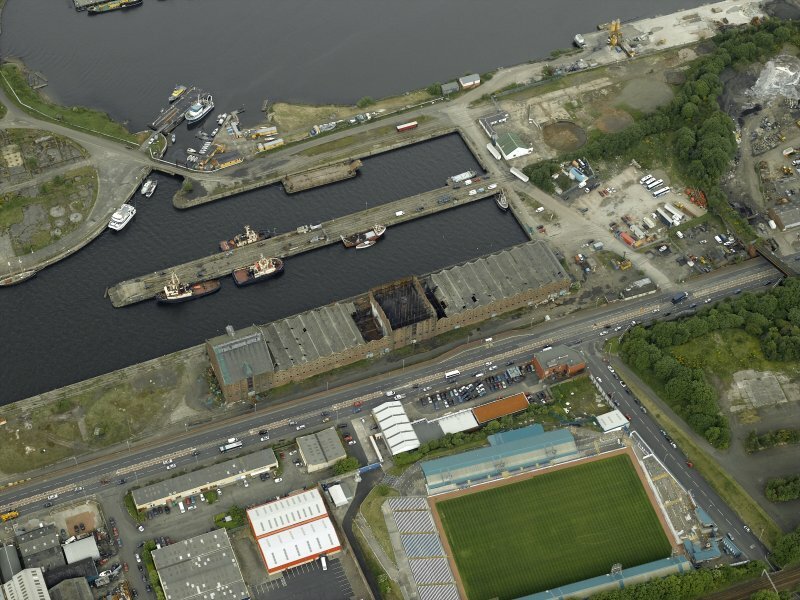 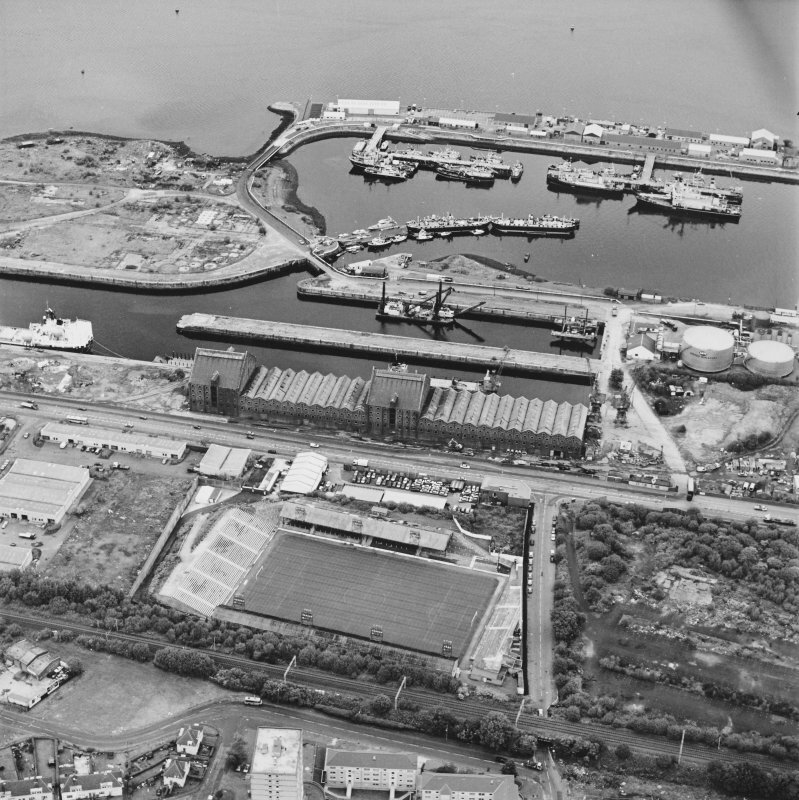 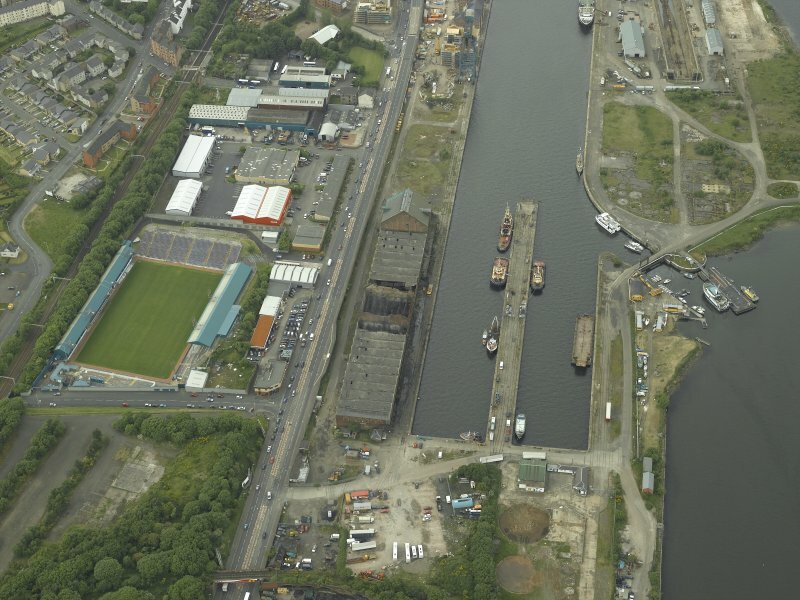 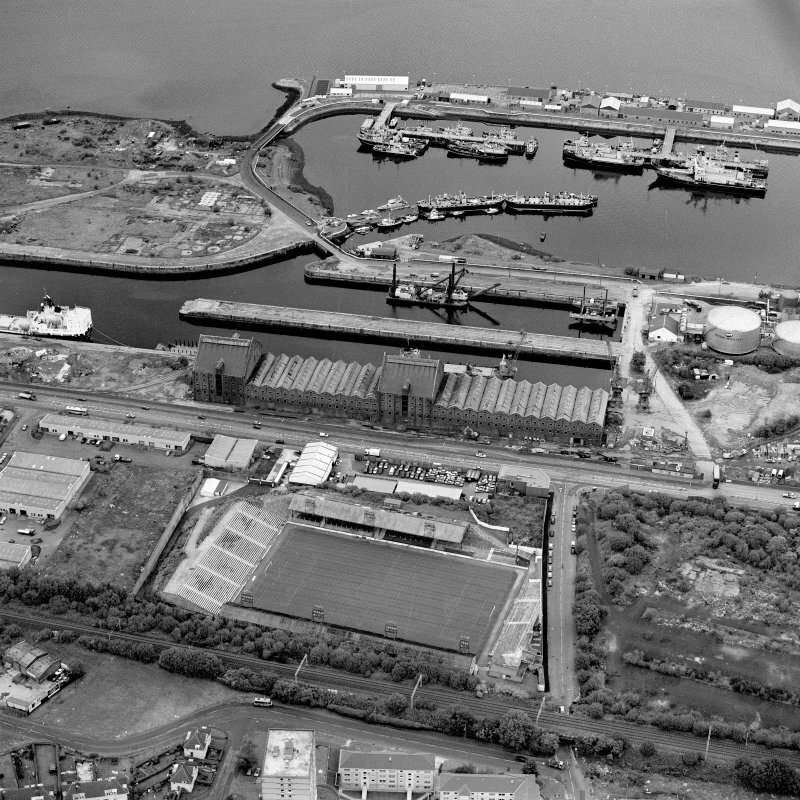 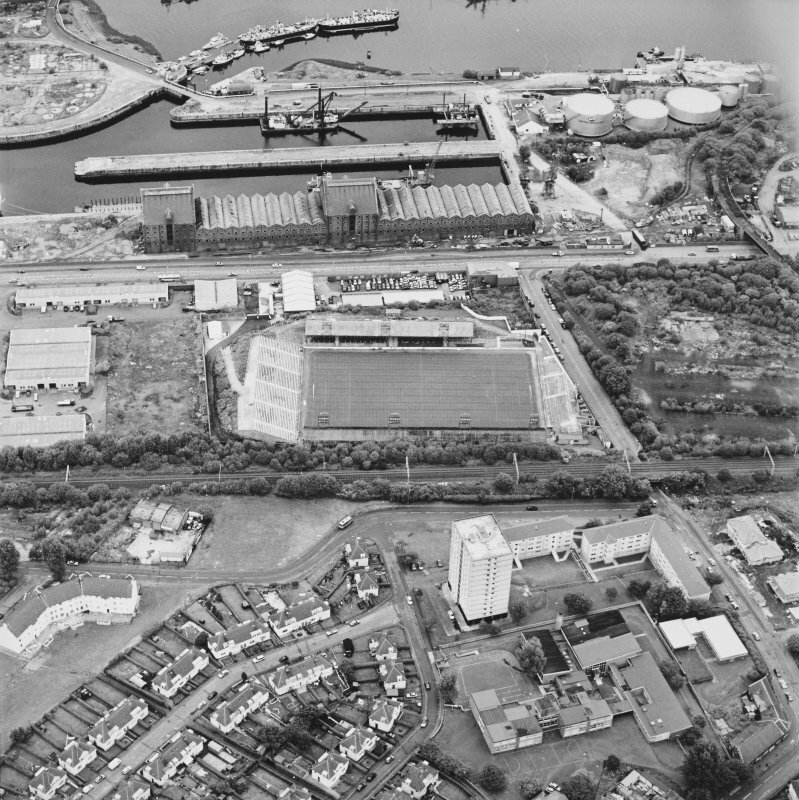 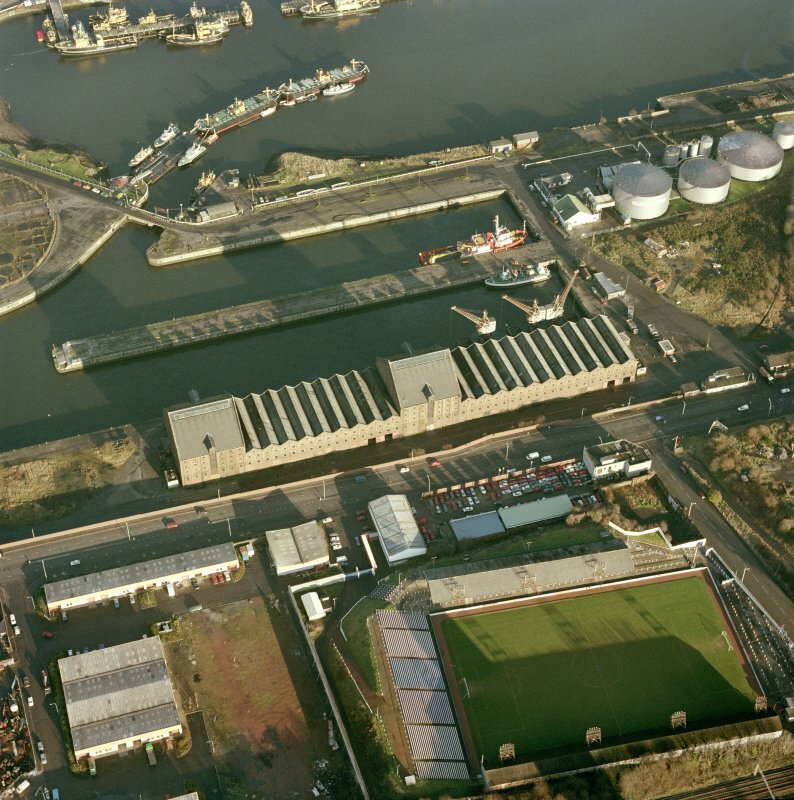 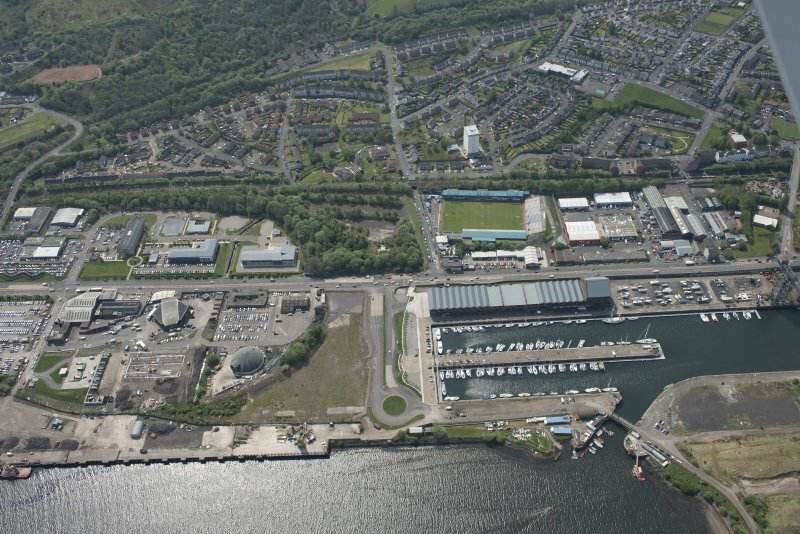 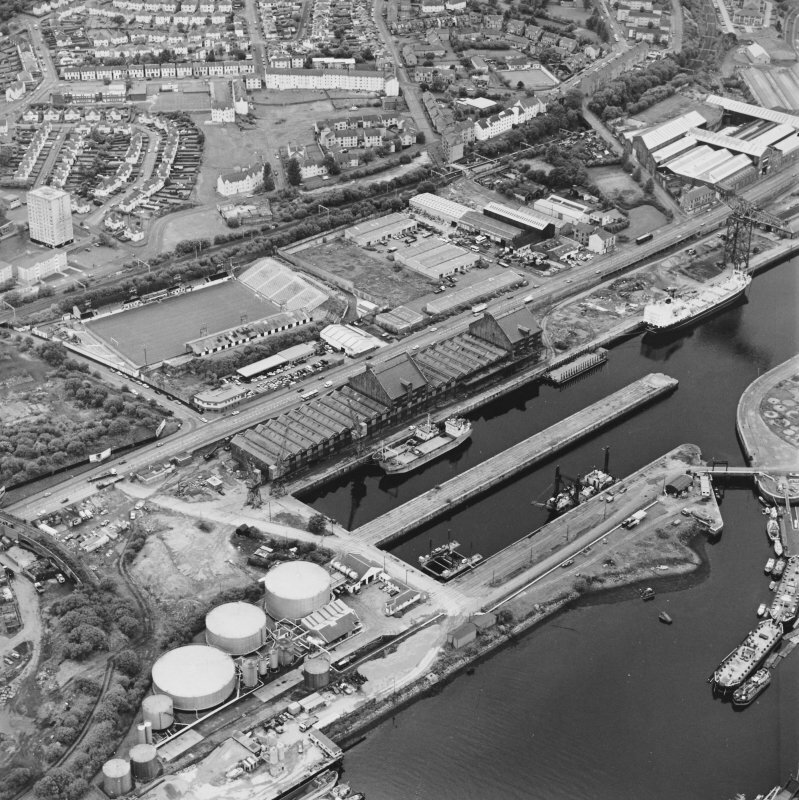 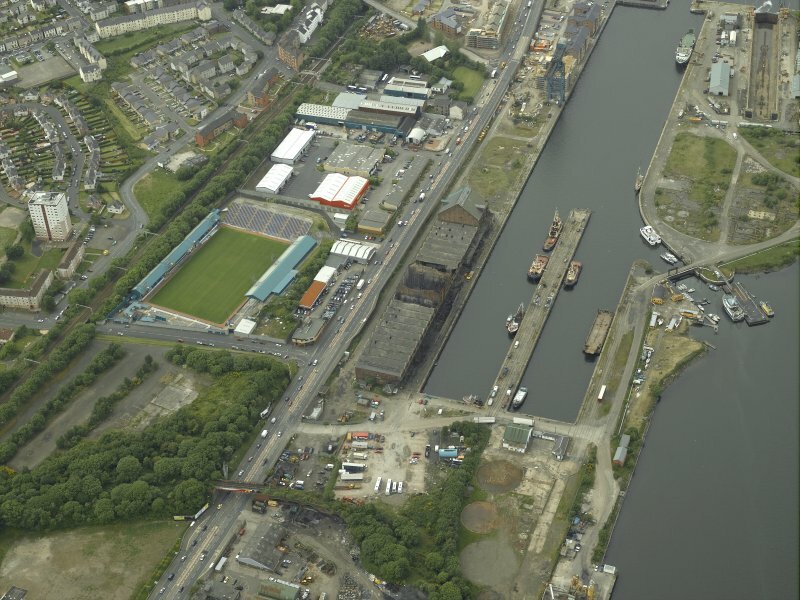 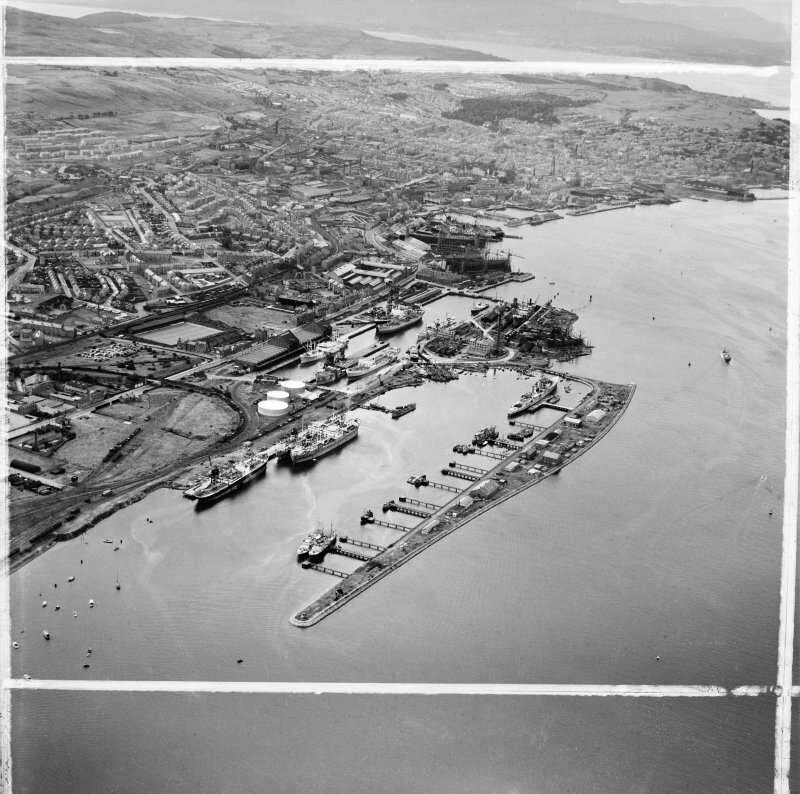 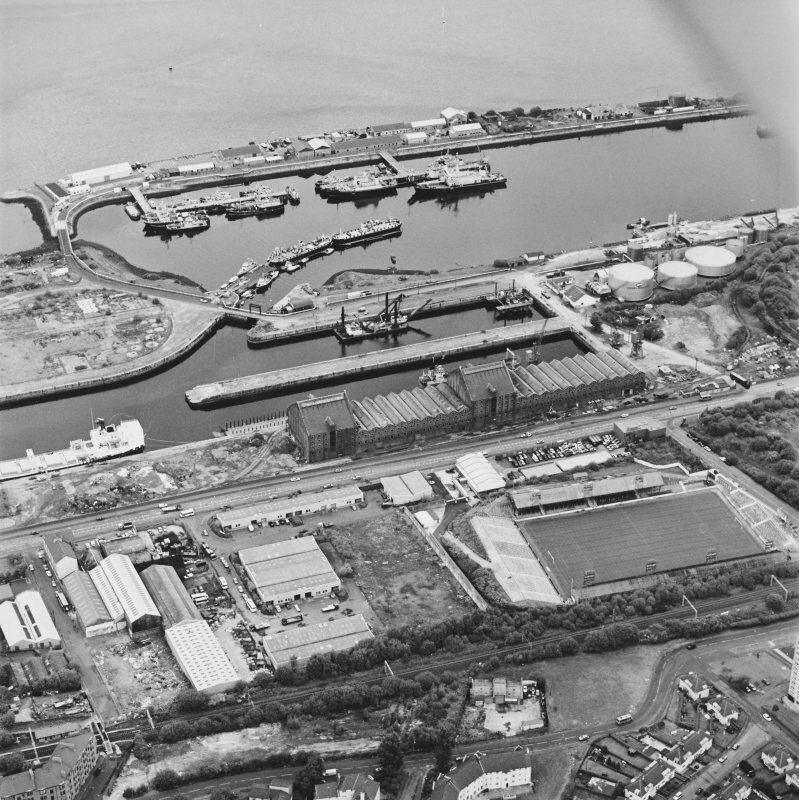 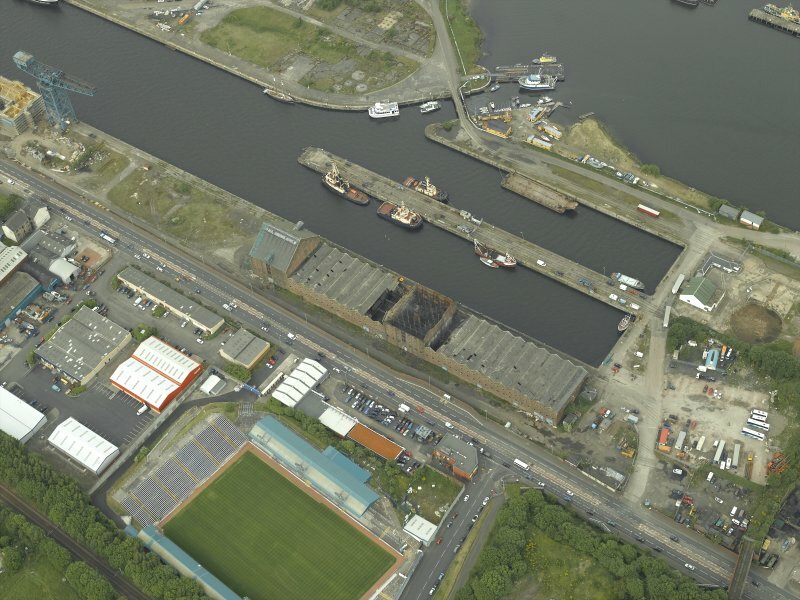 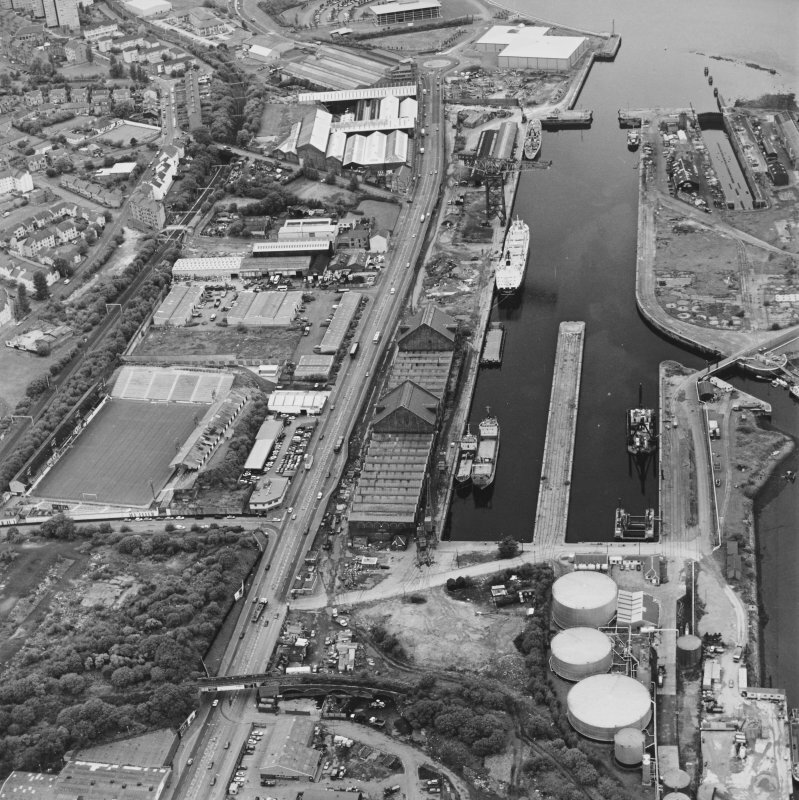 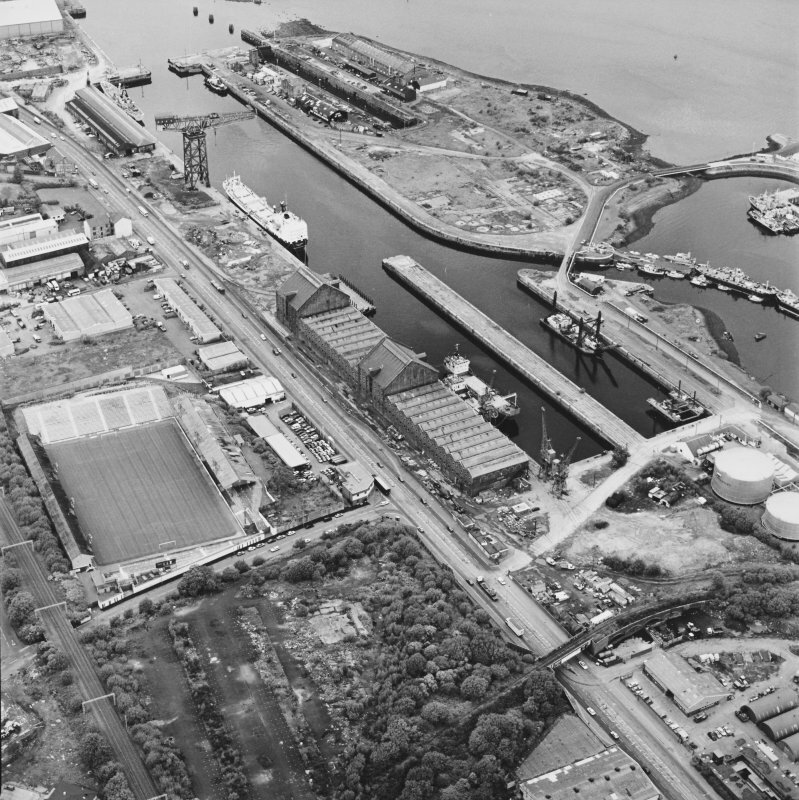 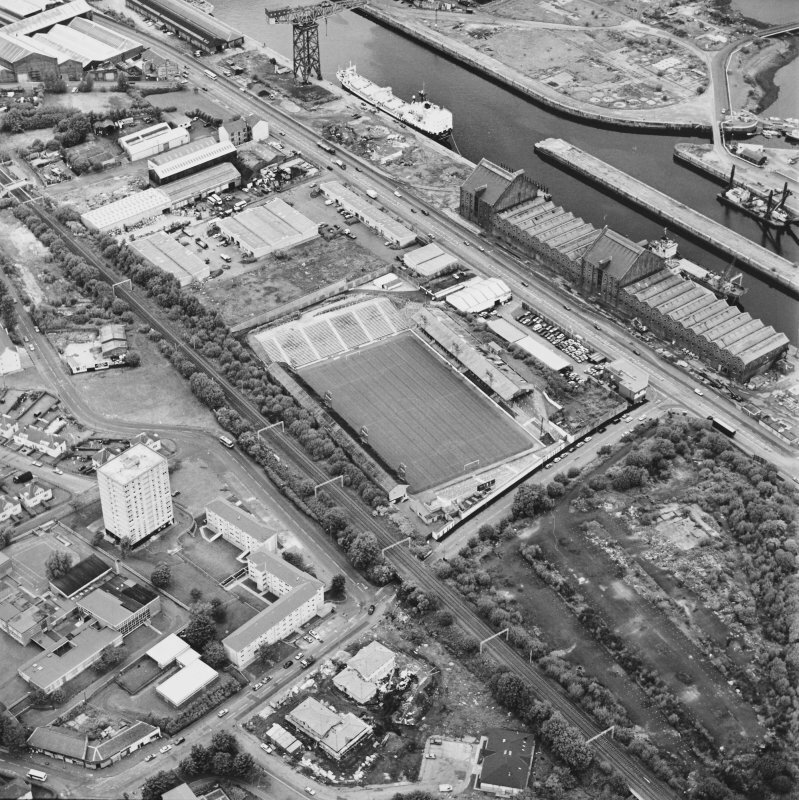 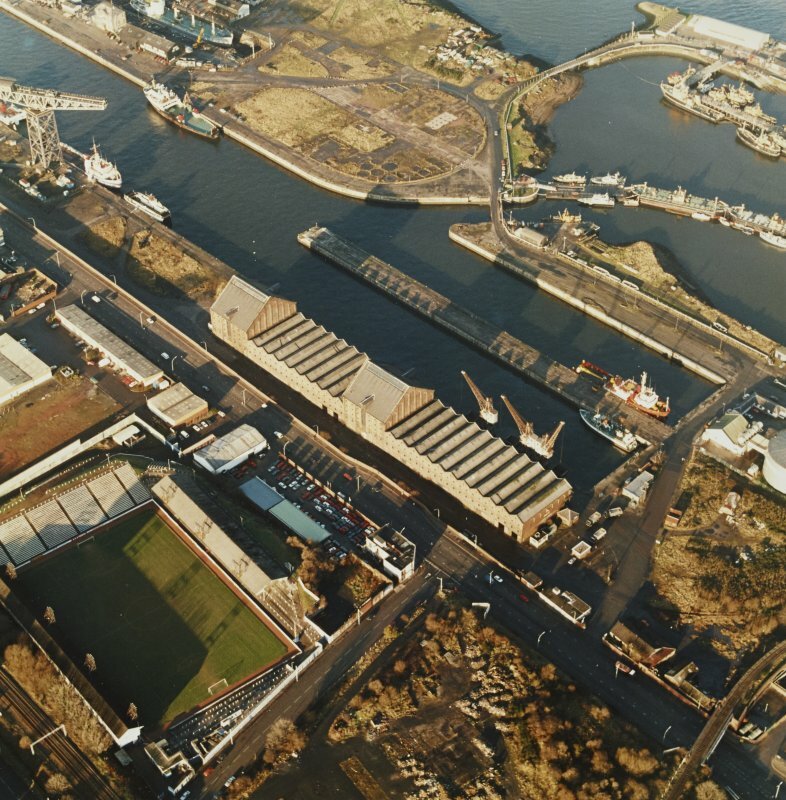 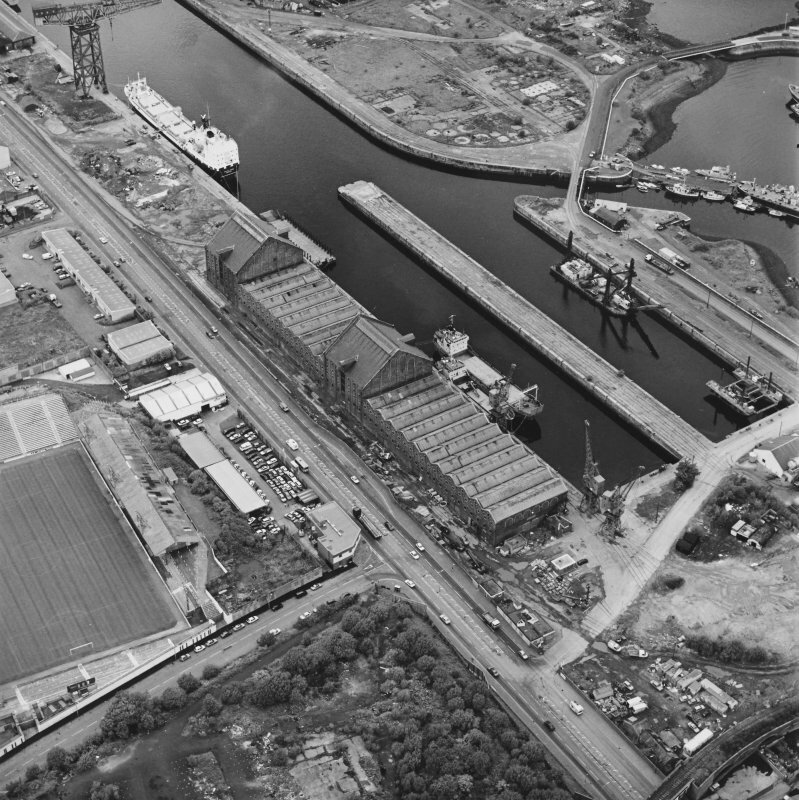 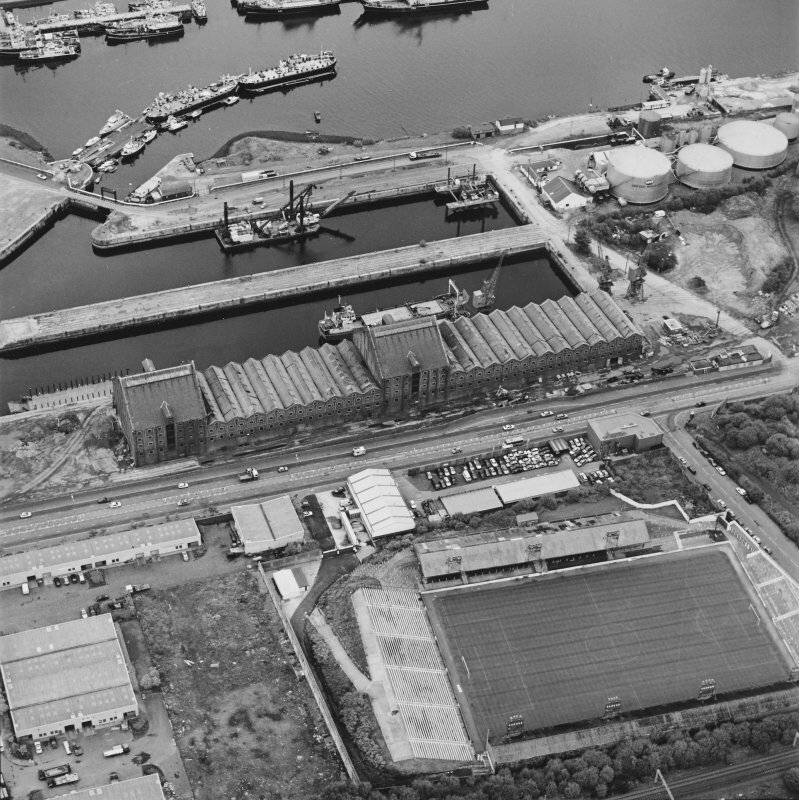 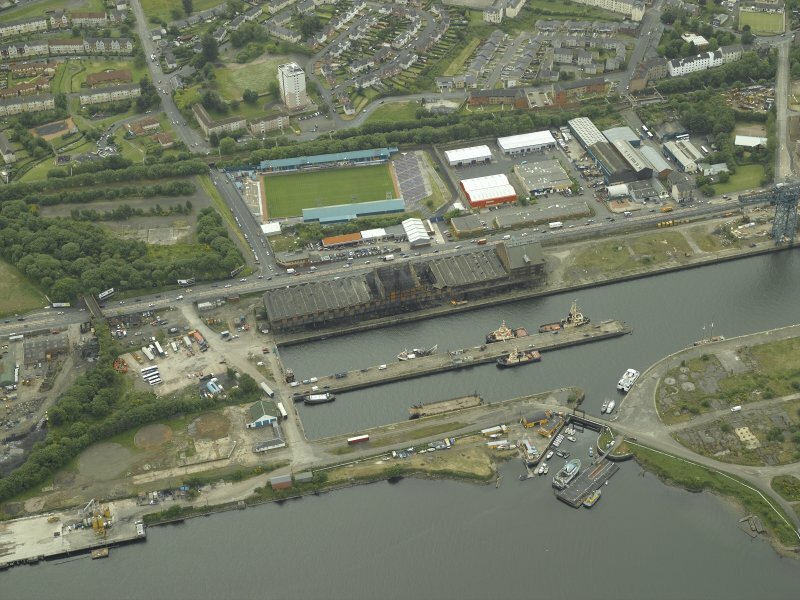 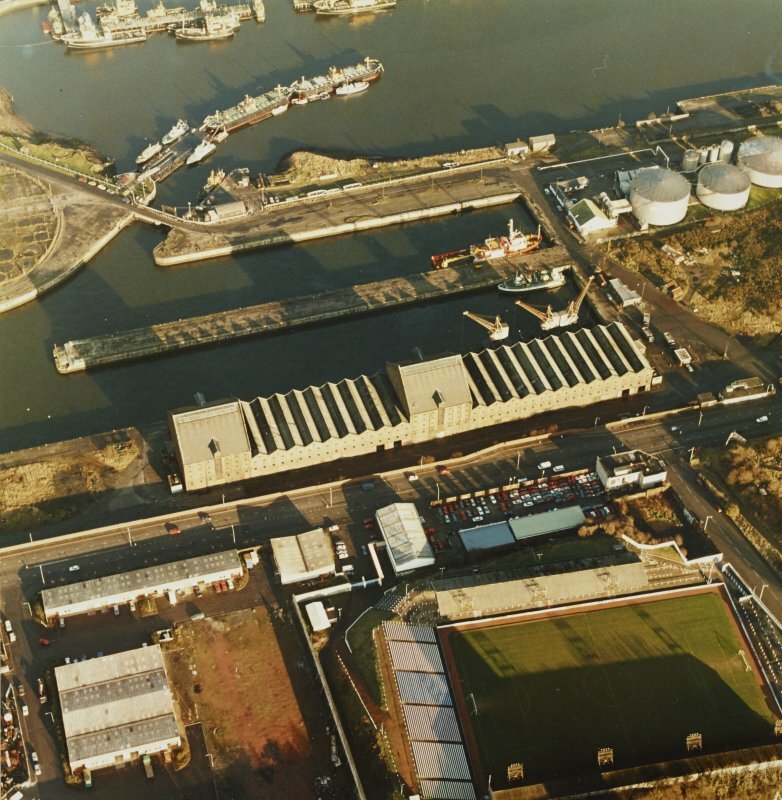 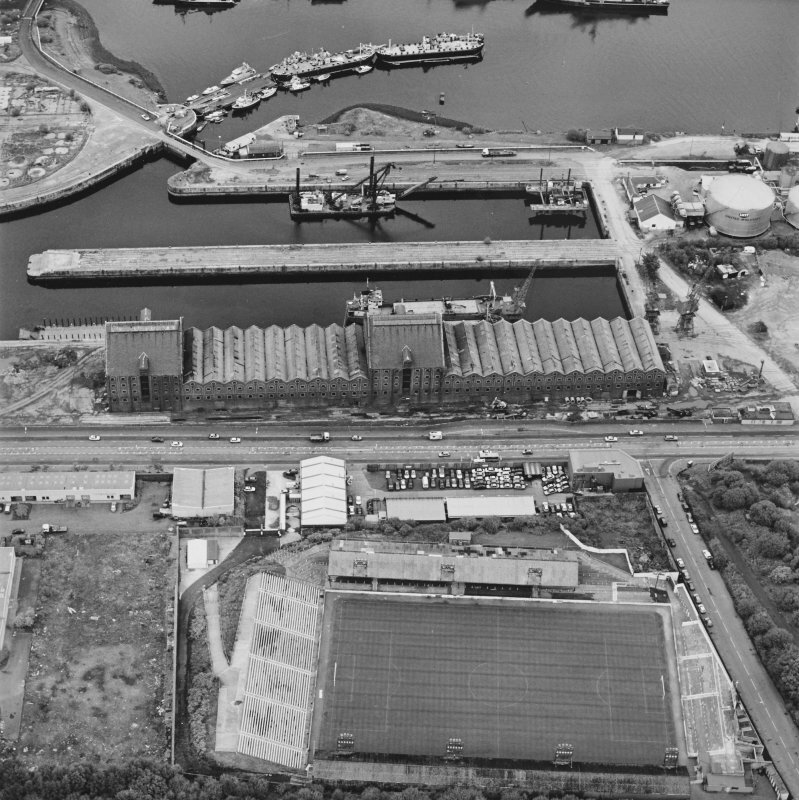 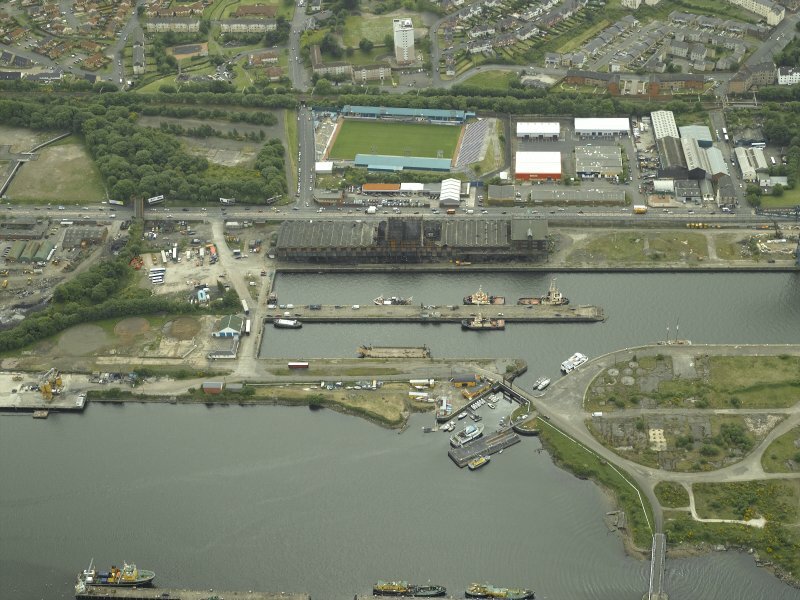 Oblique aerial view centred on the burnt out sugar warehouse and the docks, taken from the SW.
Oblique aerial view centred on the football ground, taken from the NE. 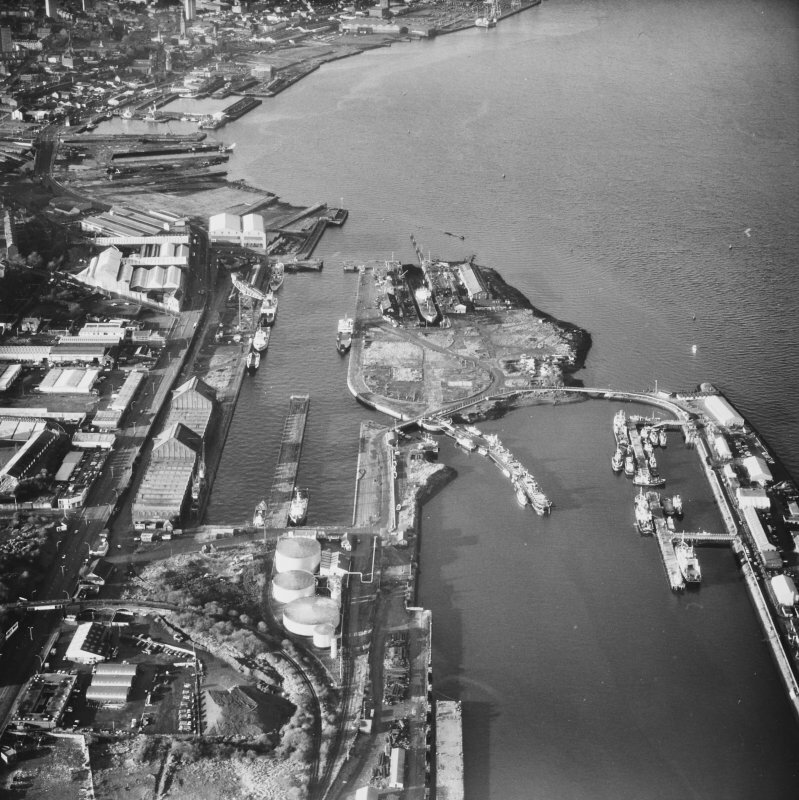 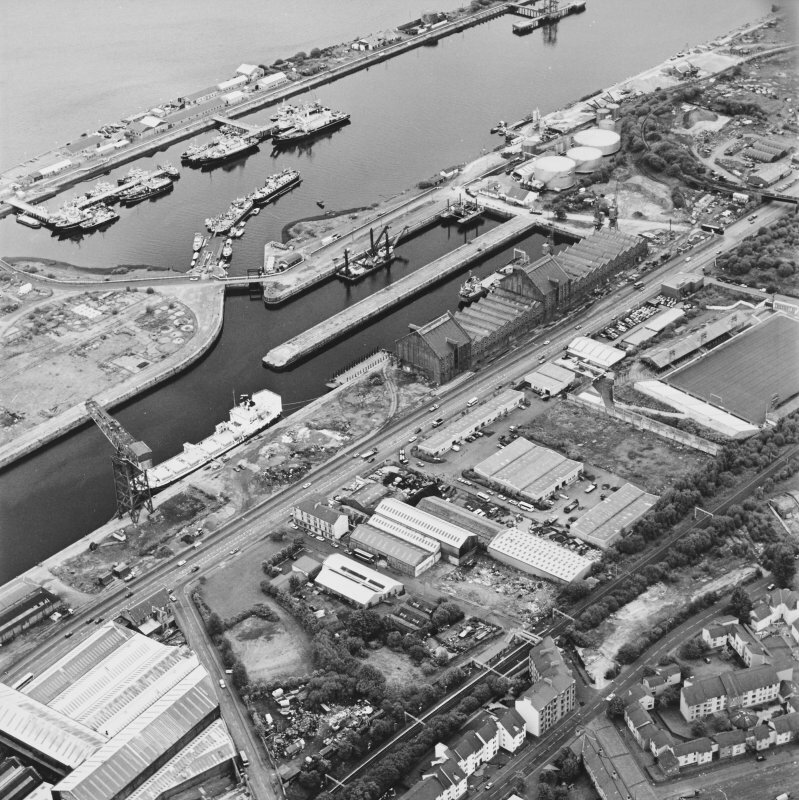 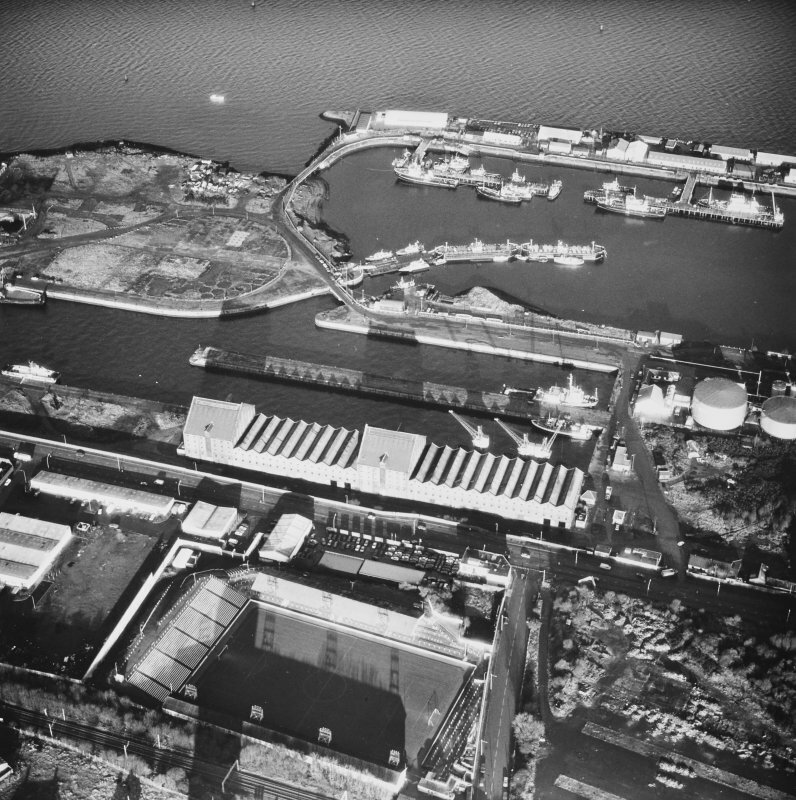 Oblique aerial view centred on the burnt out sugar warehouse and the docks, taken from the NE. 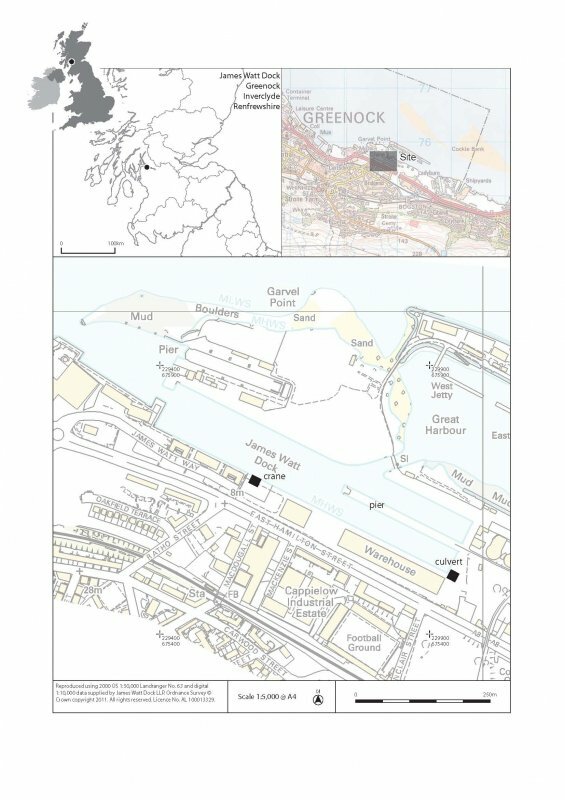 Location formerly entered as NS 2982 7552. 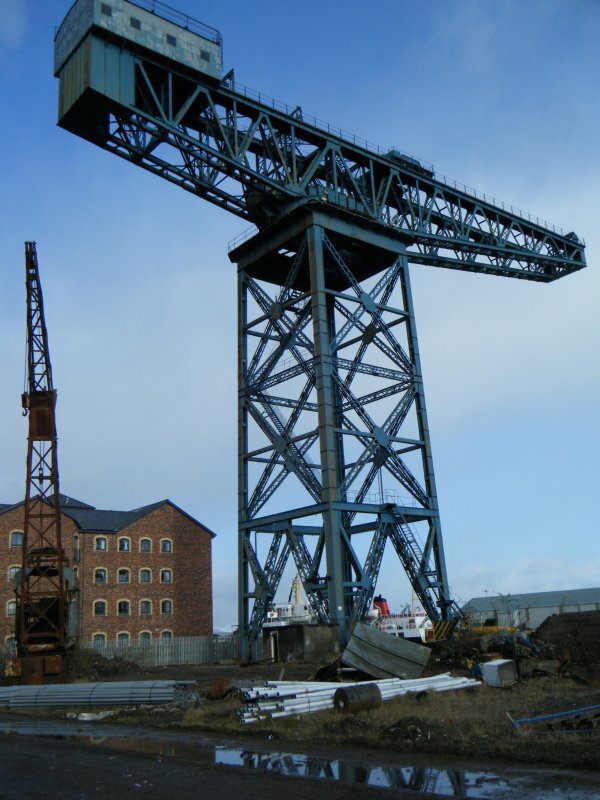 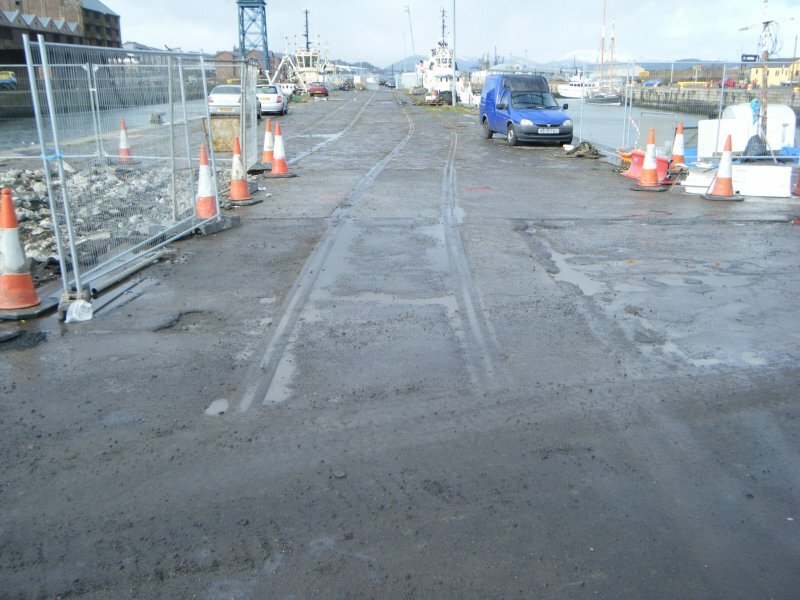 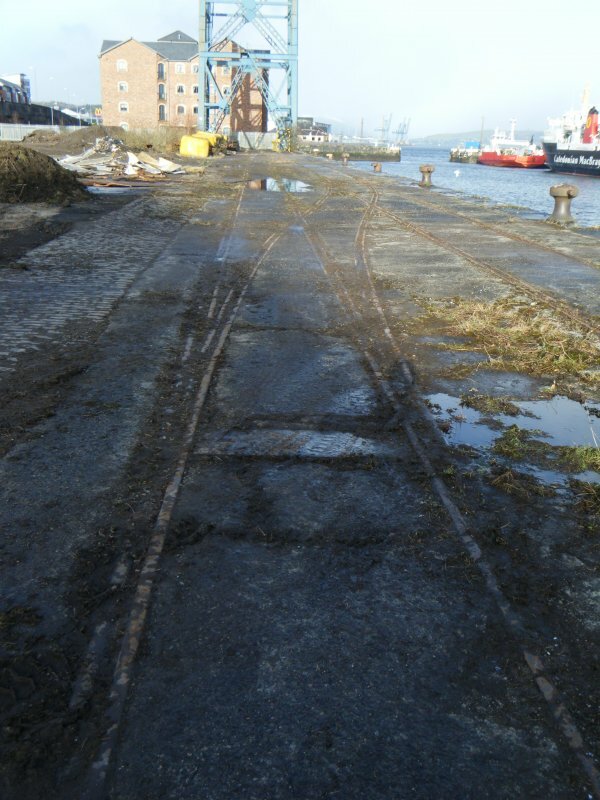 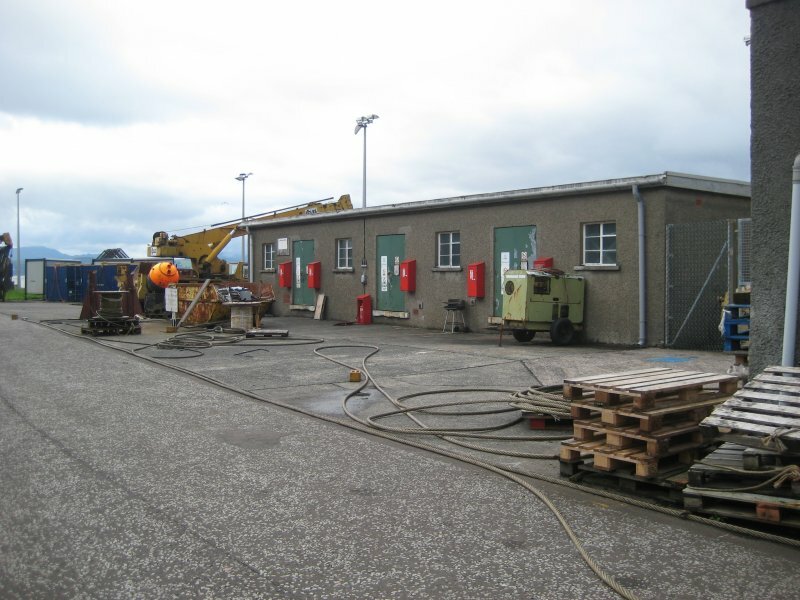 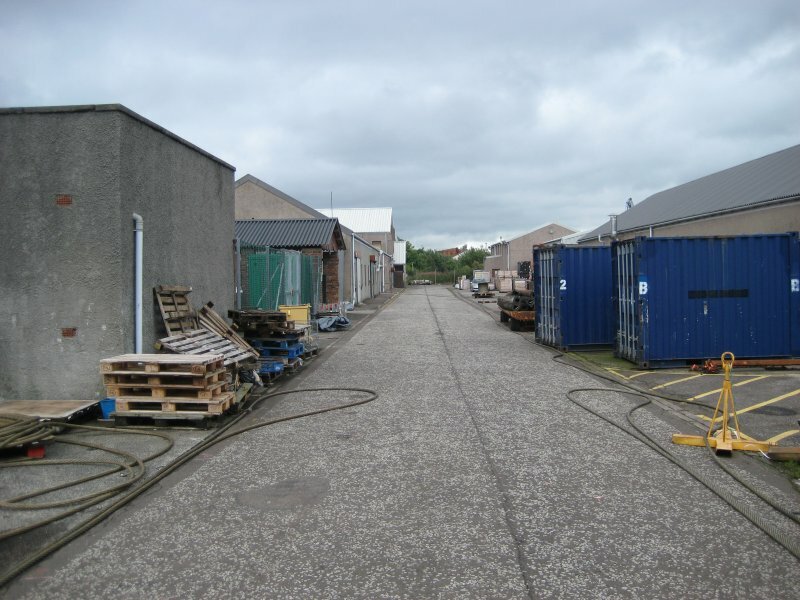 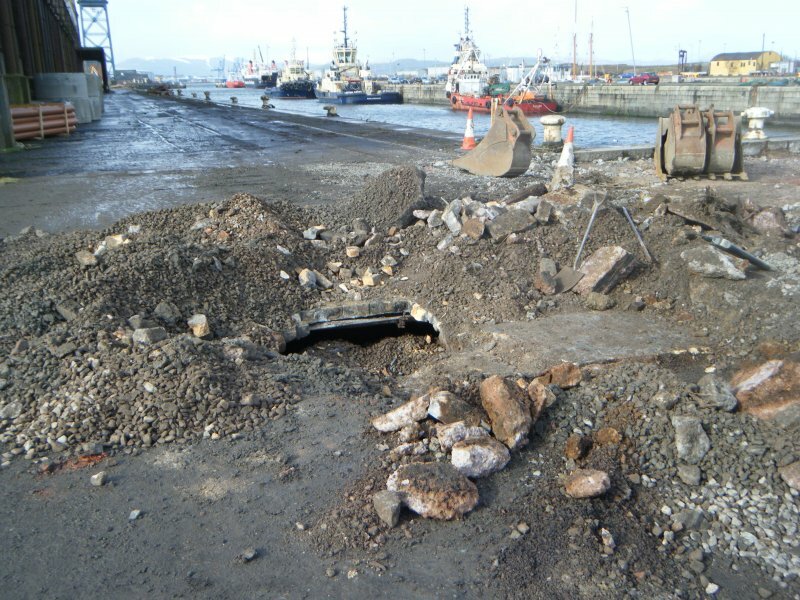 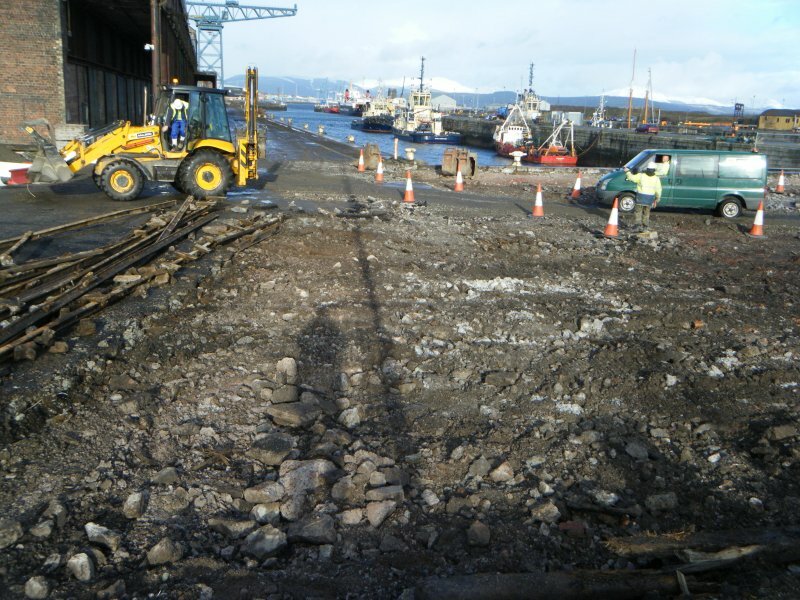 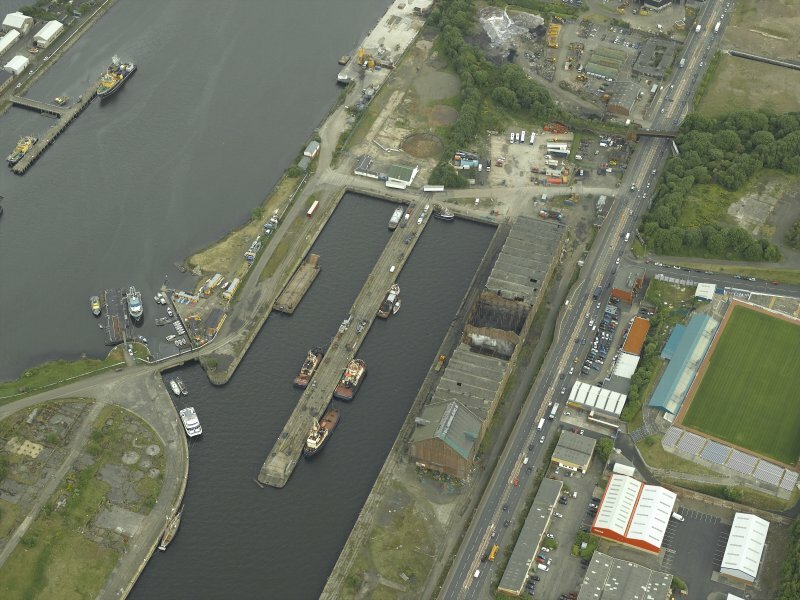 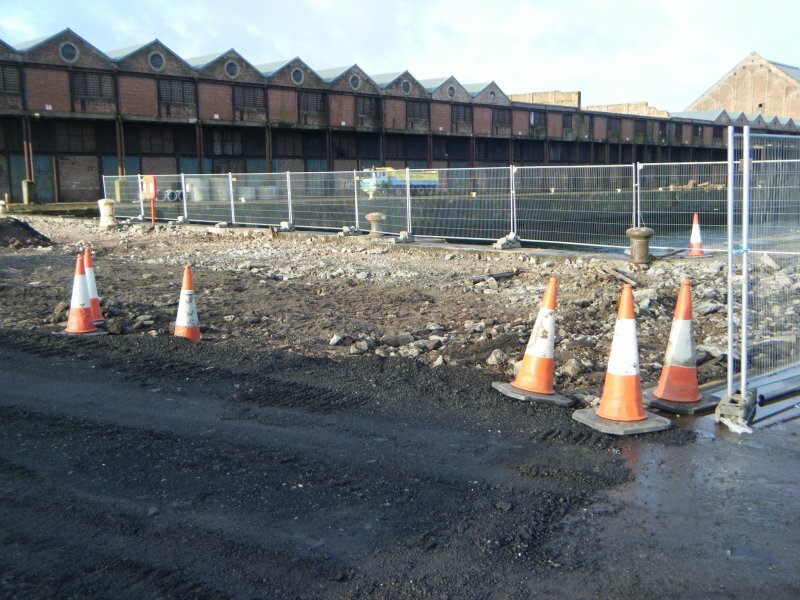 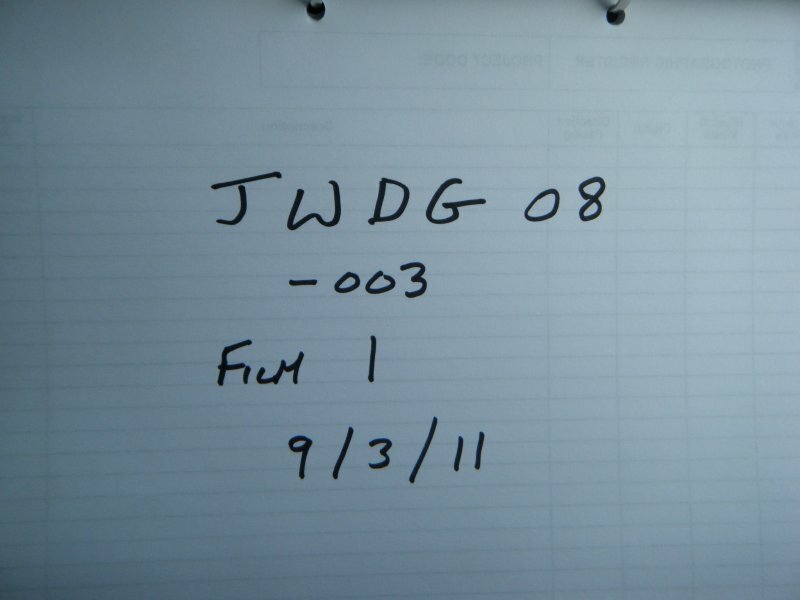 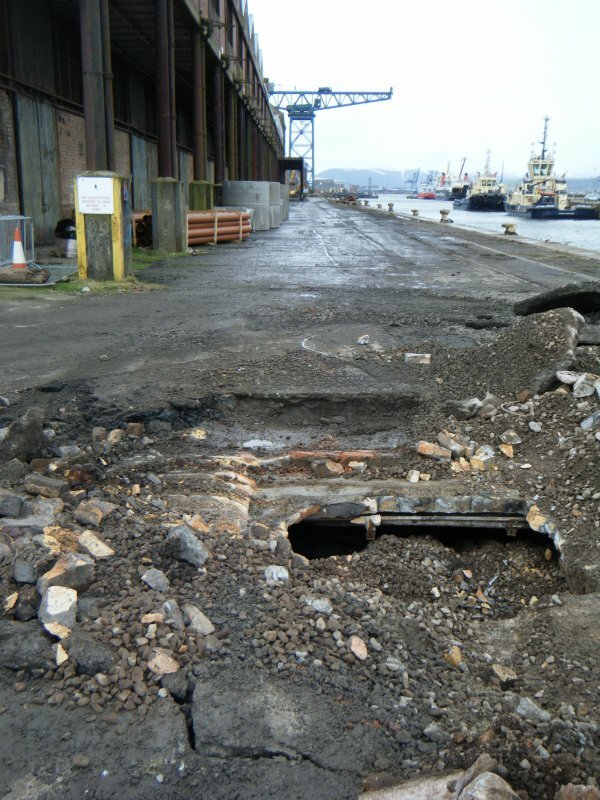 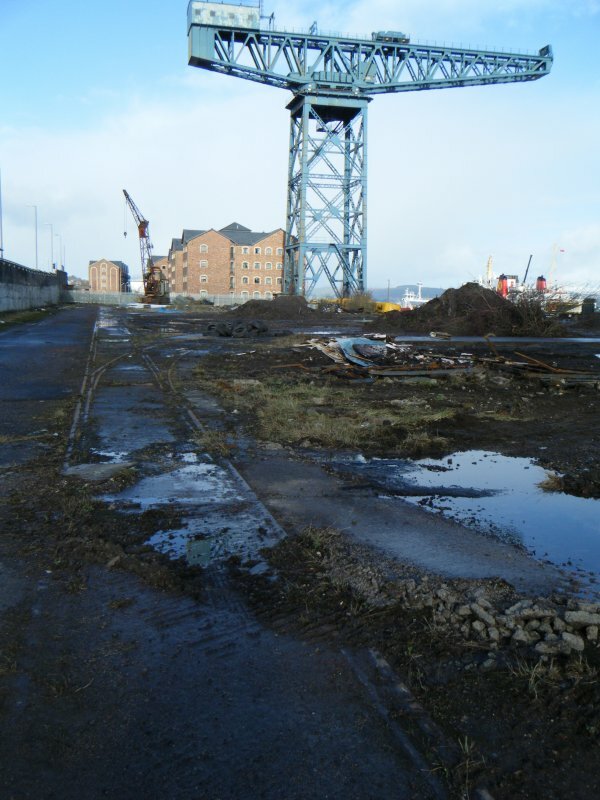 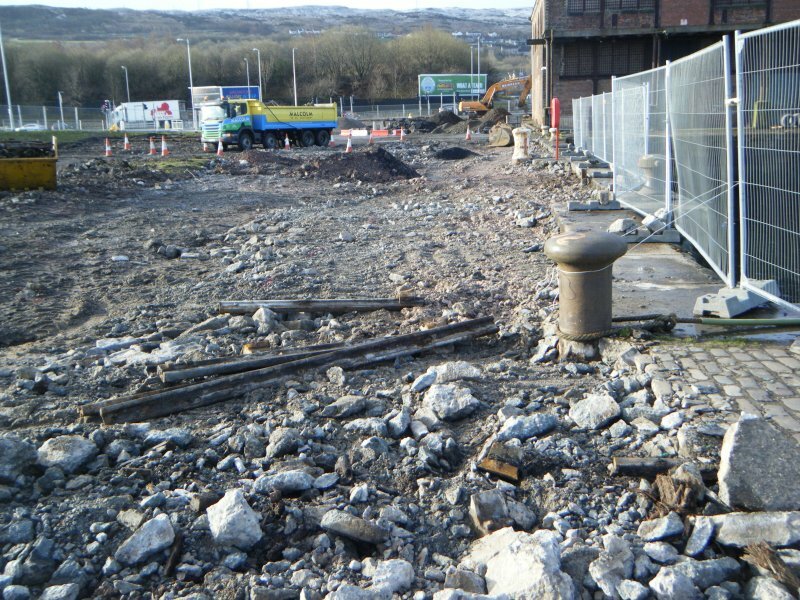 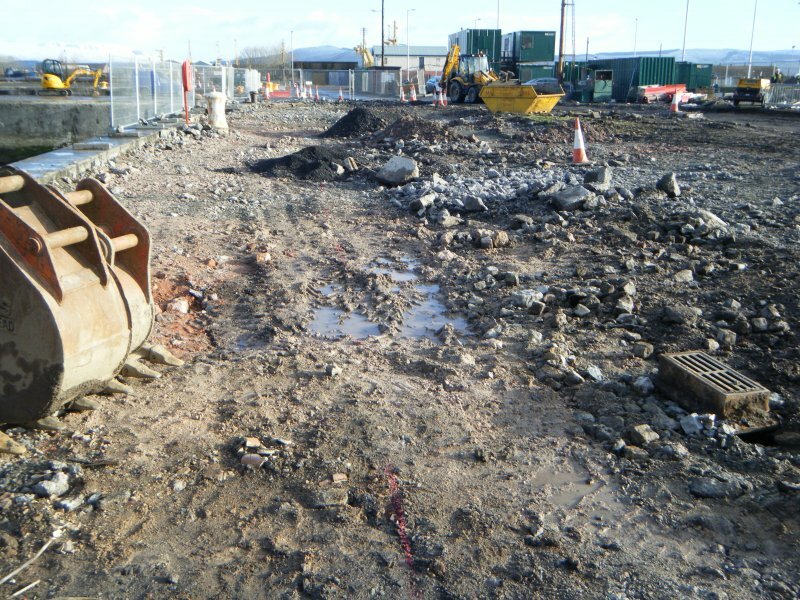 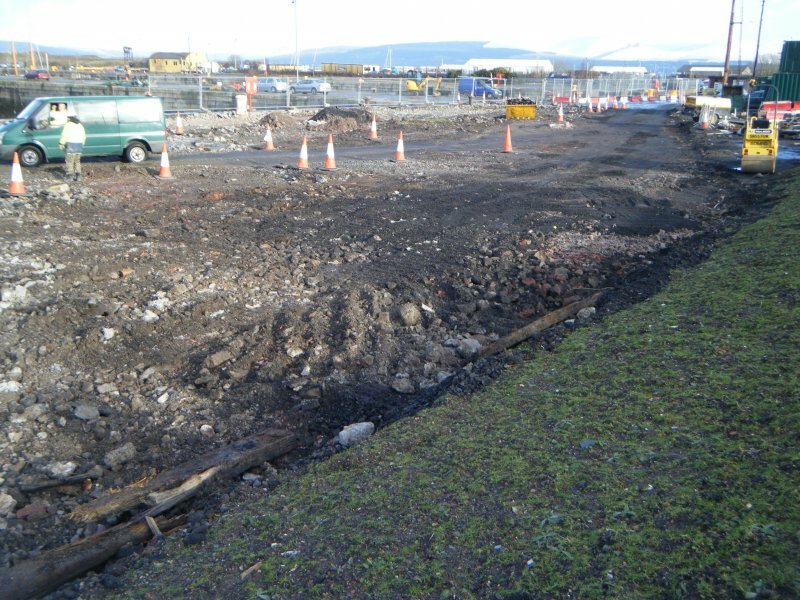 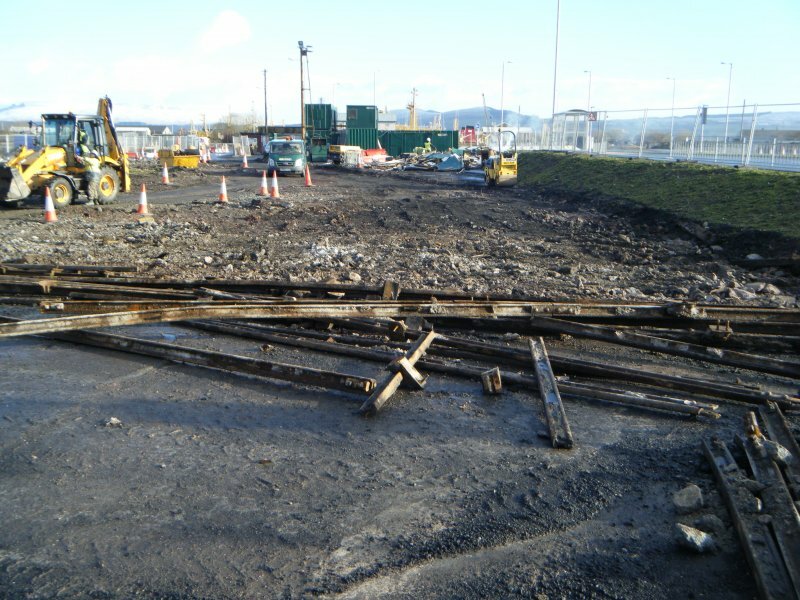 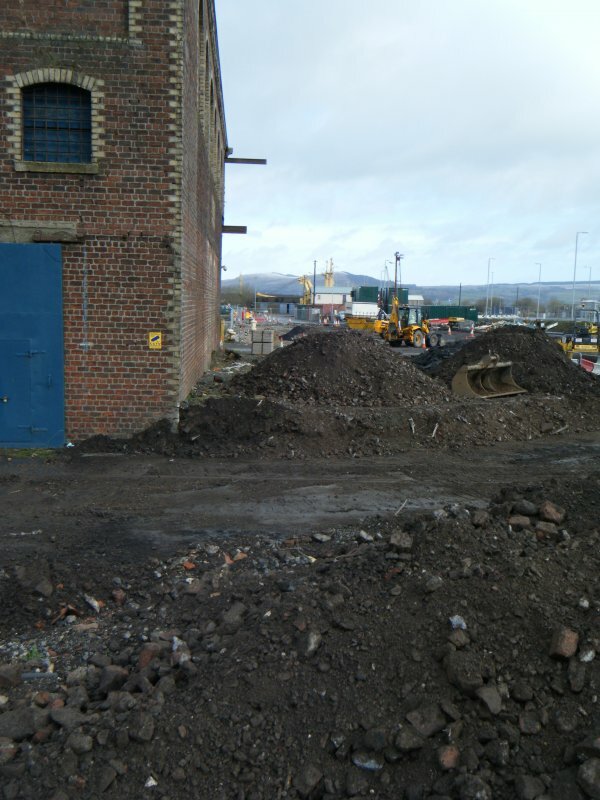 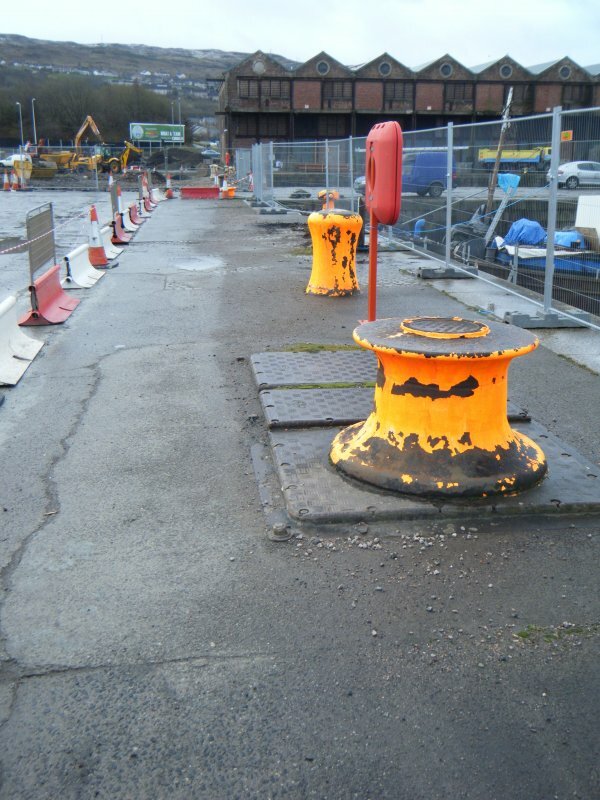 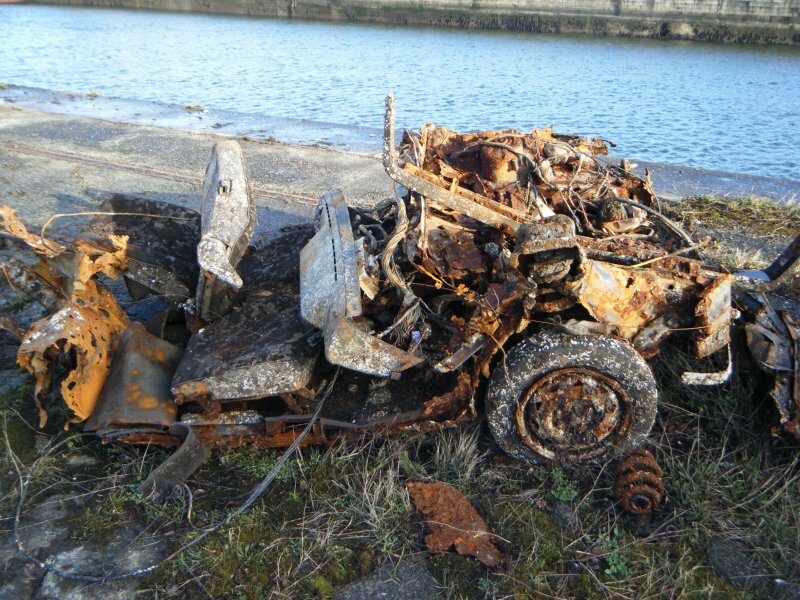 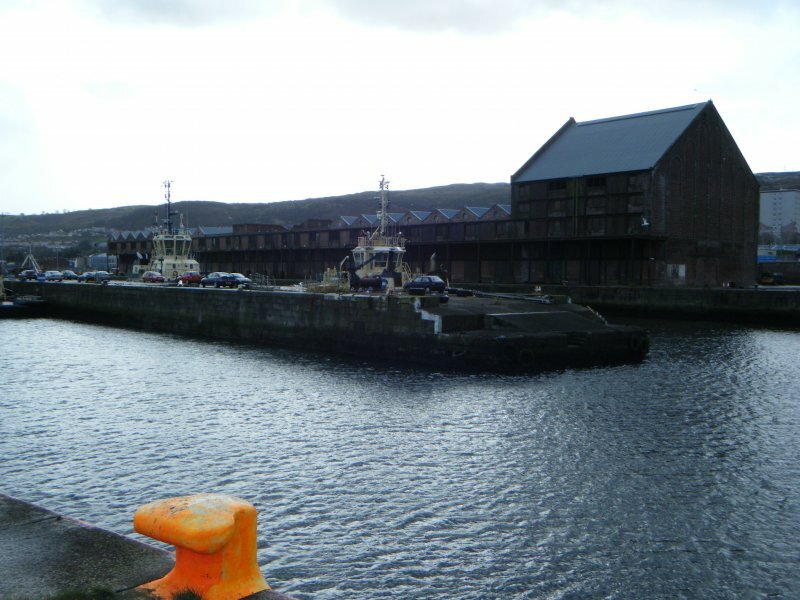 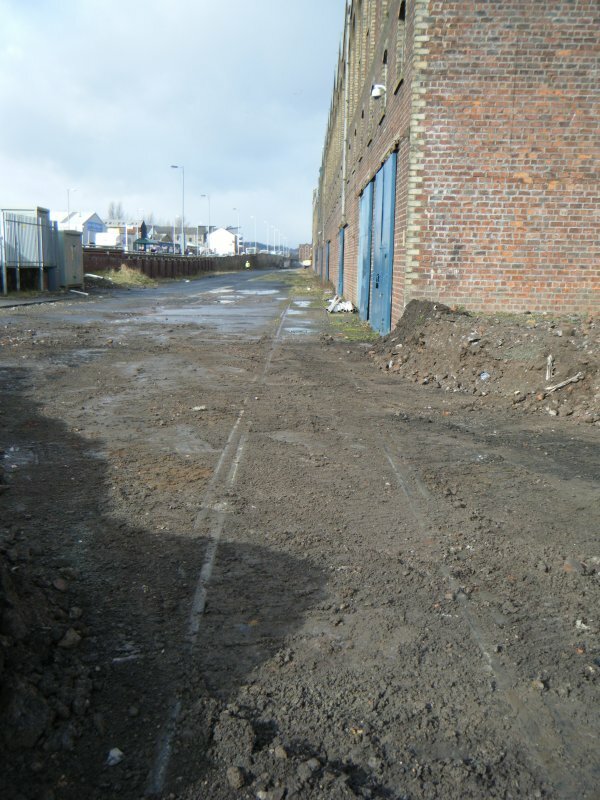 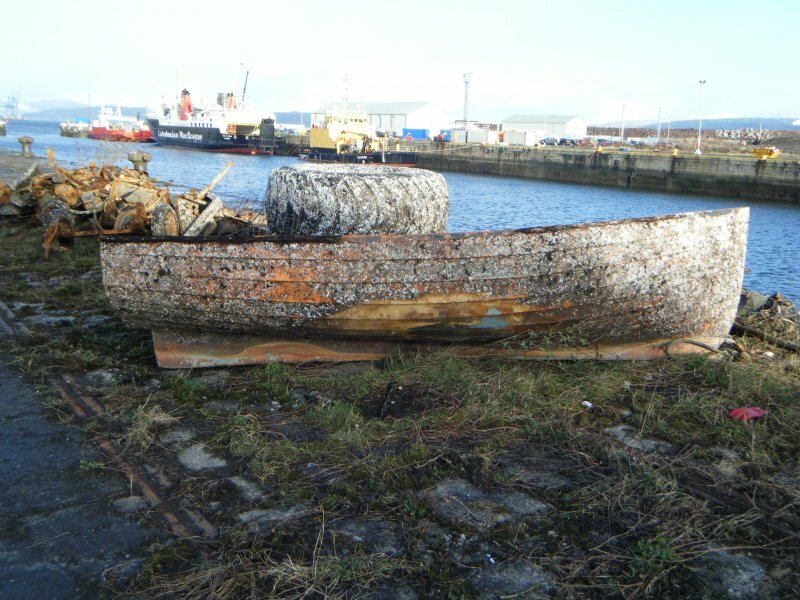 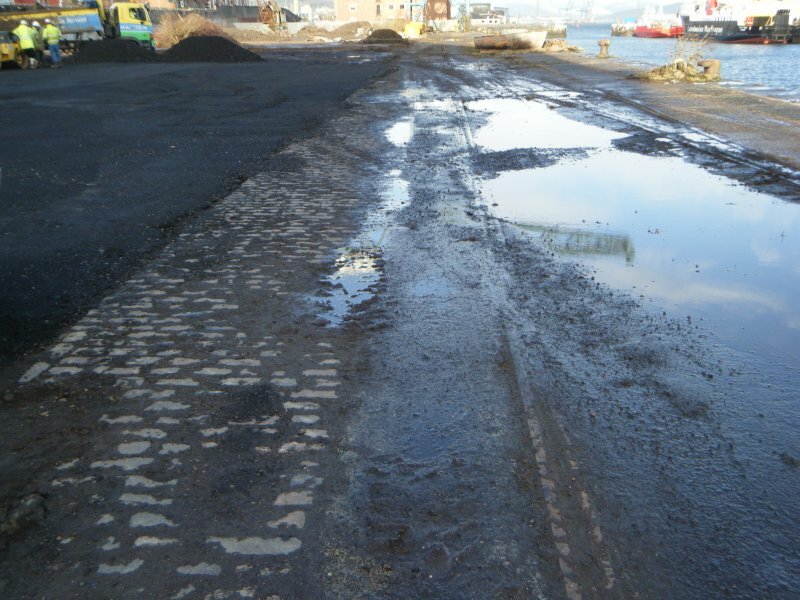 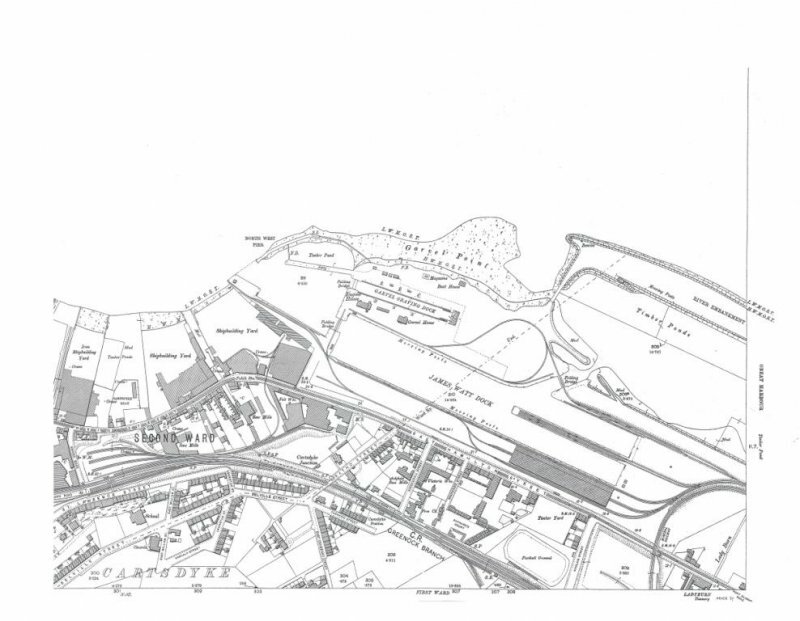 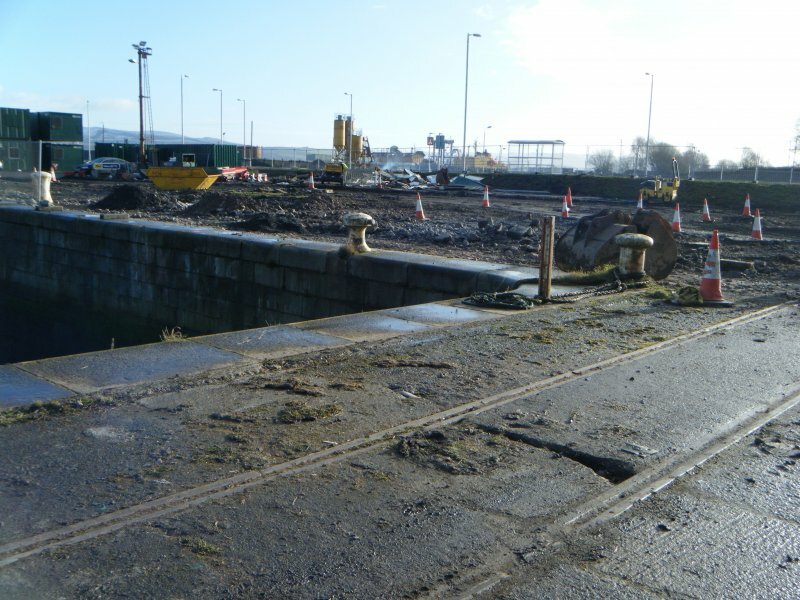 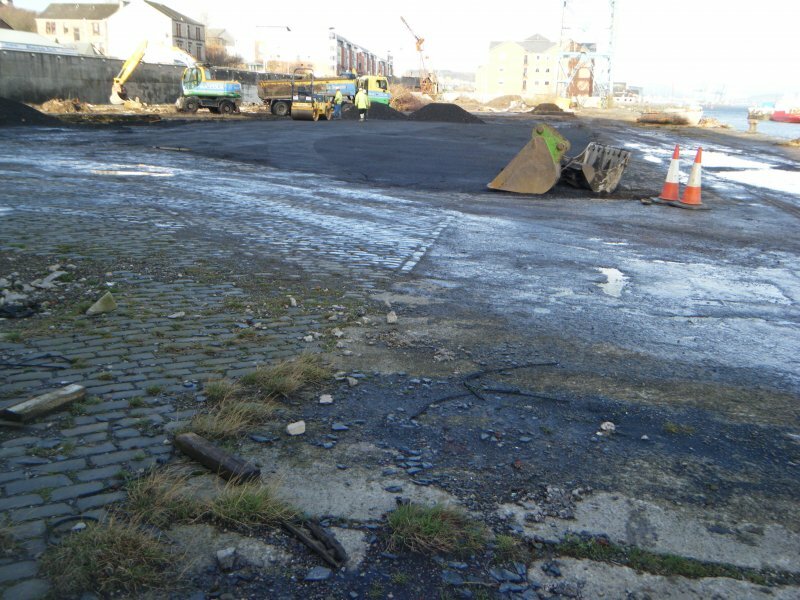 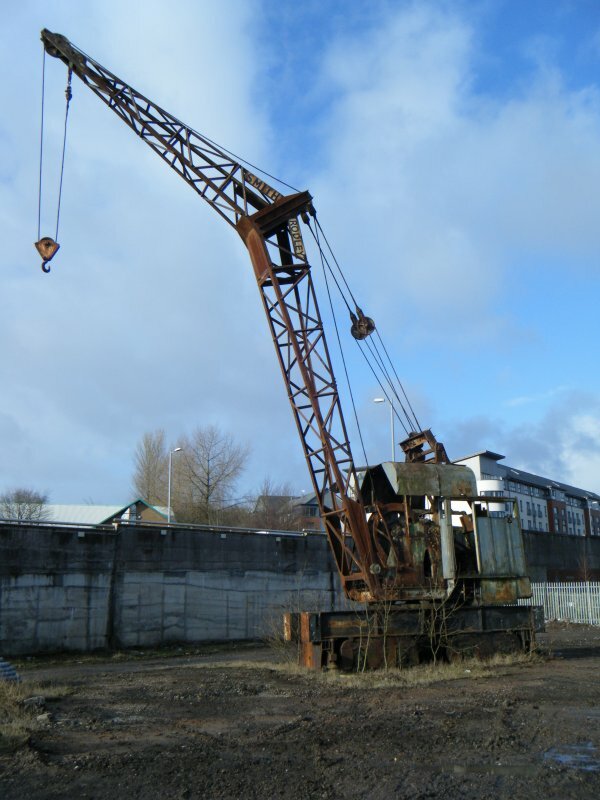 For James Watt Dock (NS 29677 75697), see NS27NE 17.00. 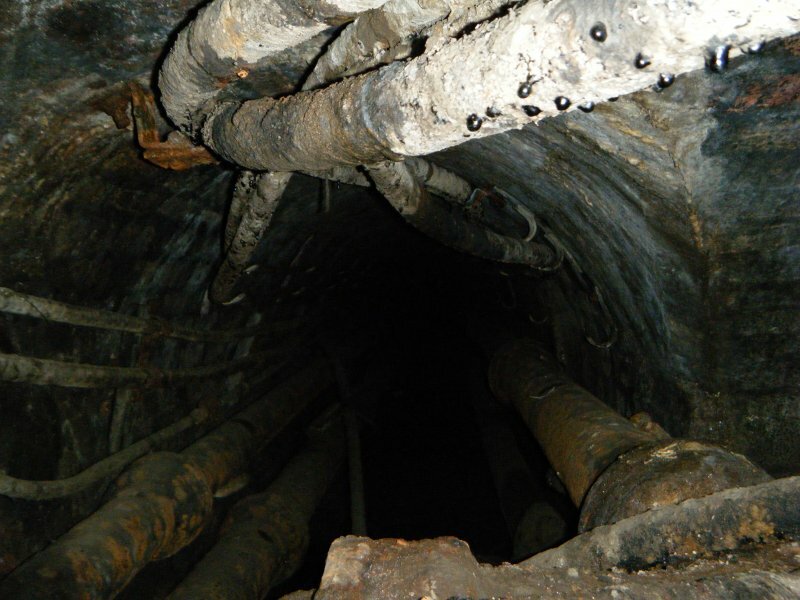 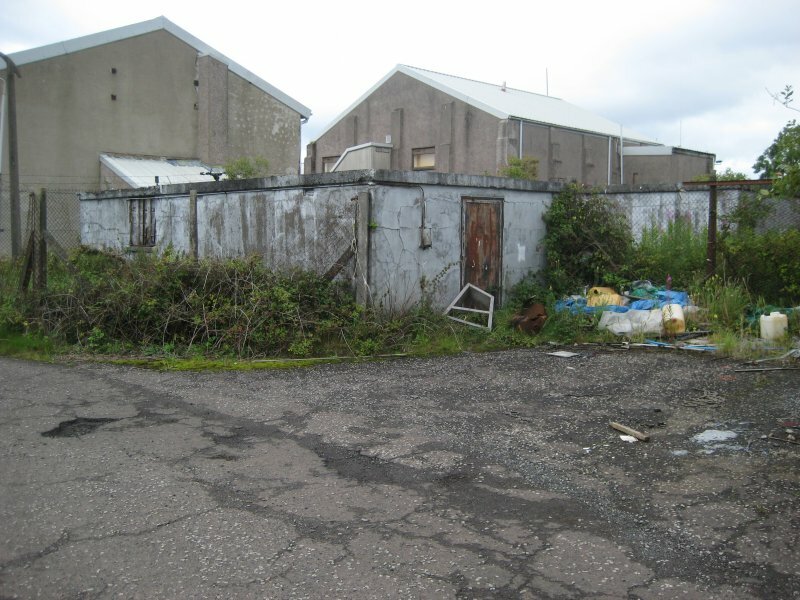 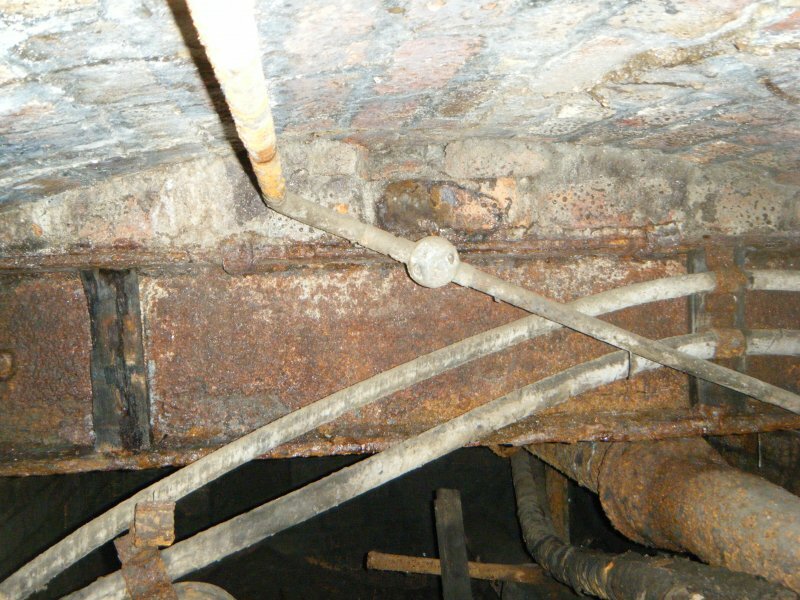 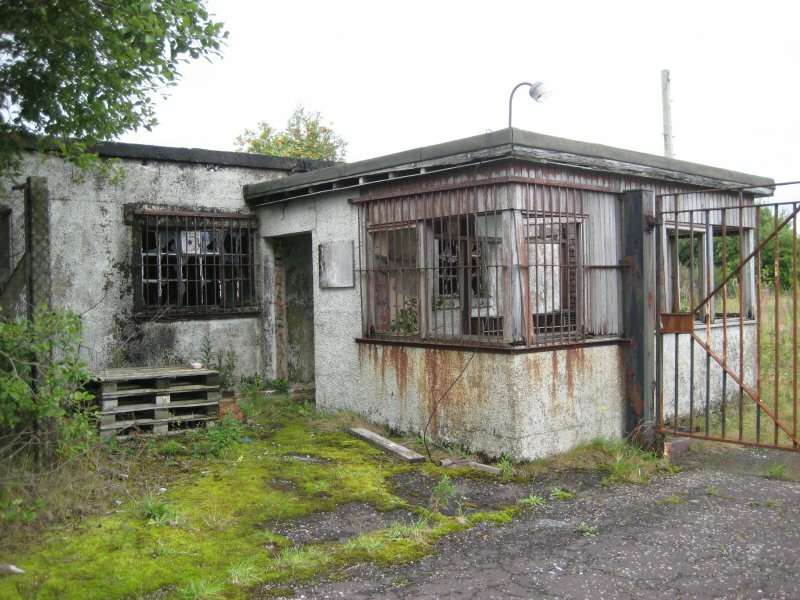 (Location cited as NS 297 757). 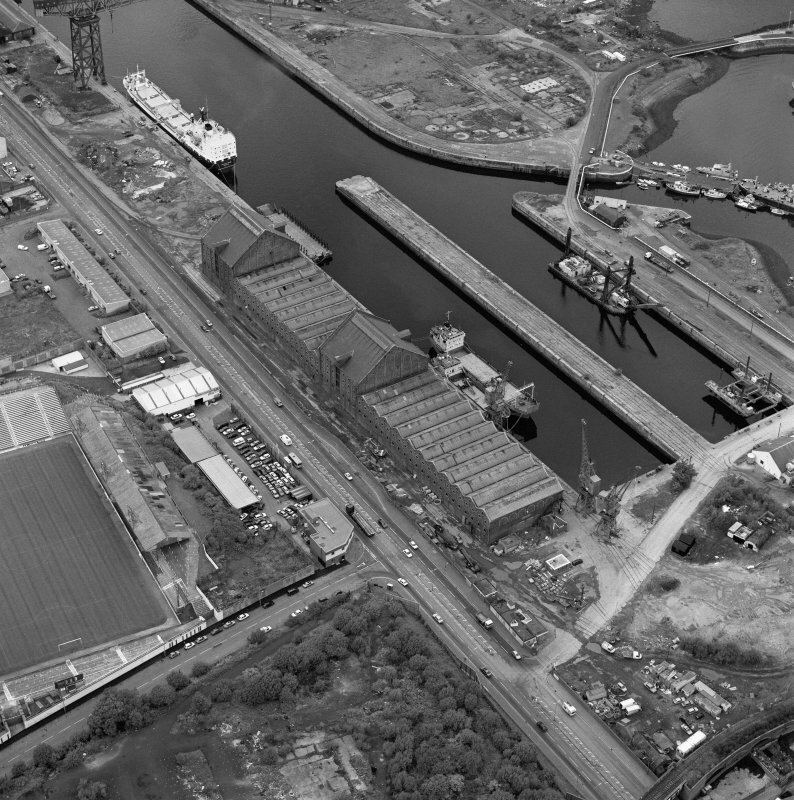 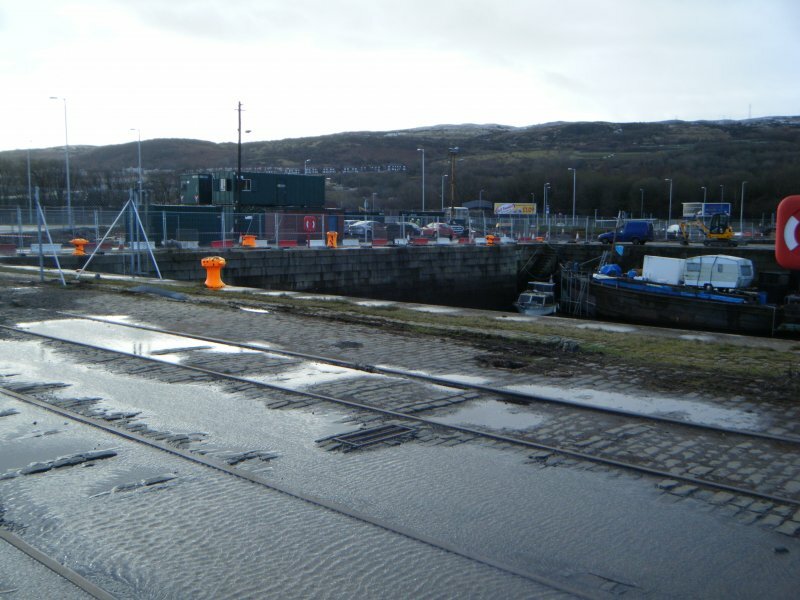 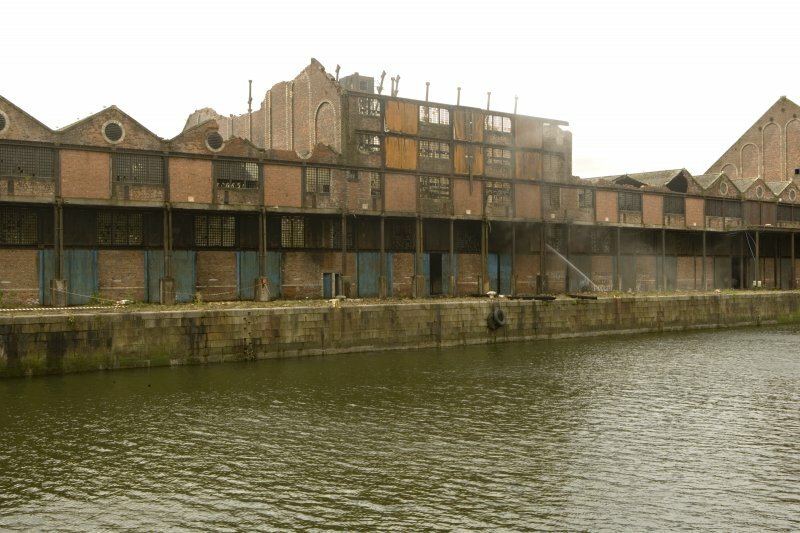 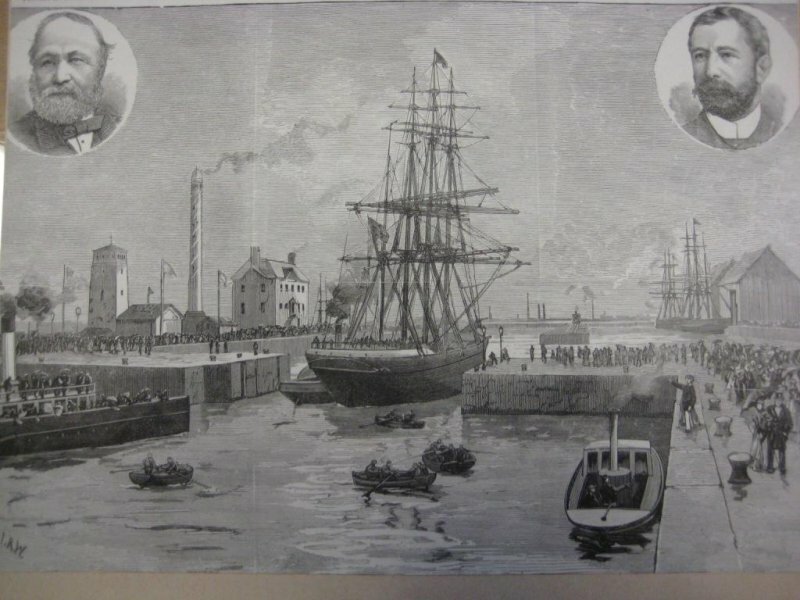 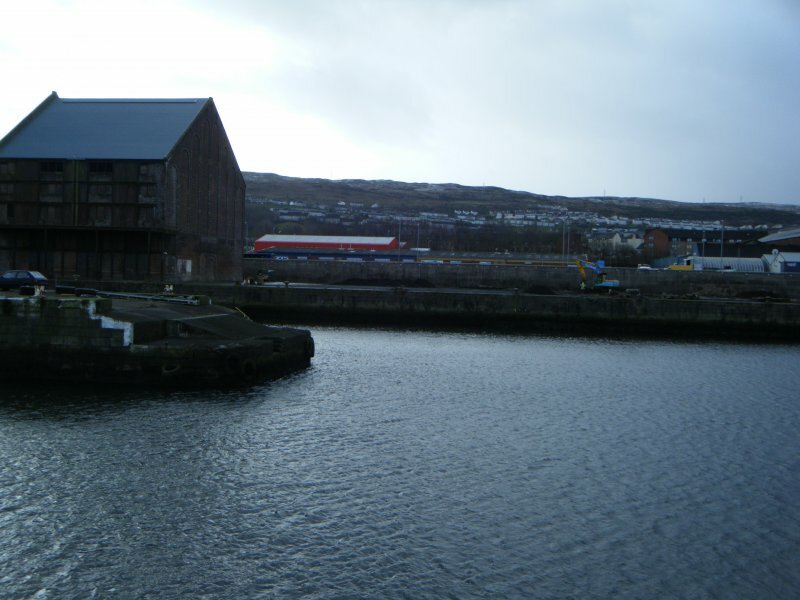 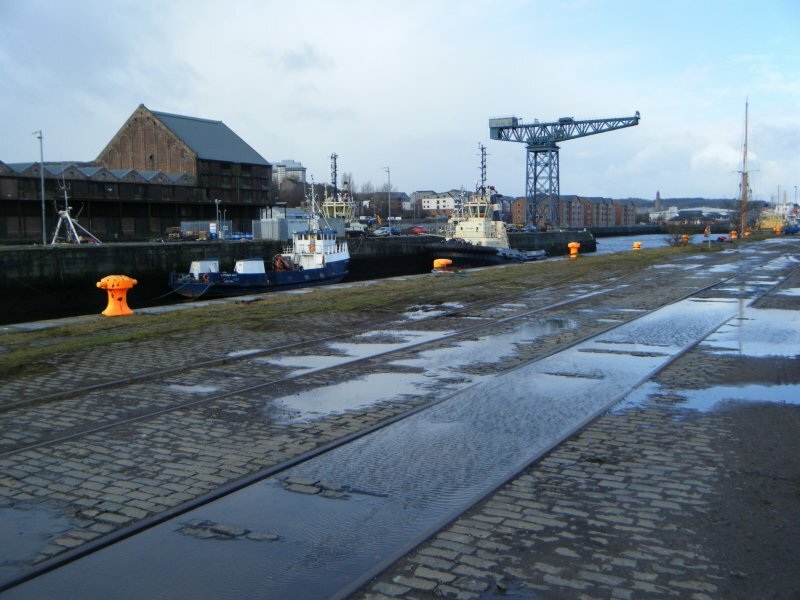 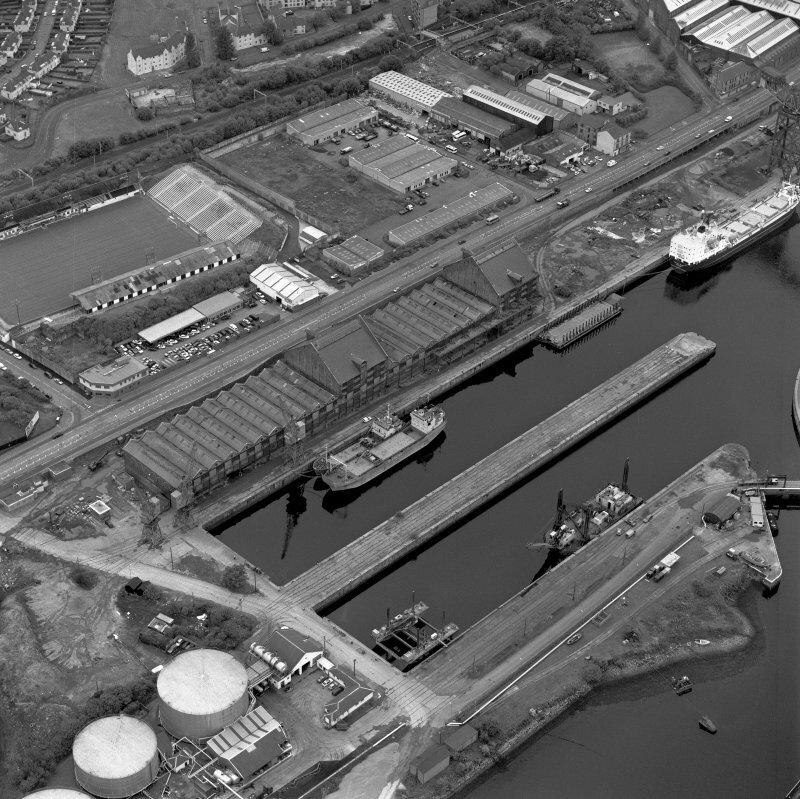 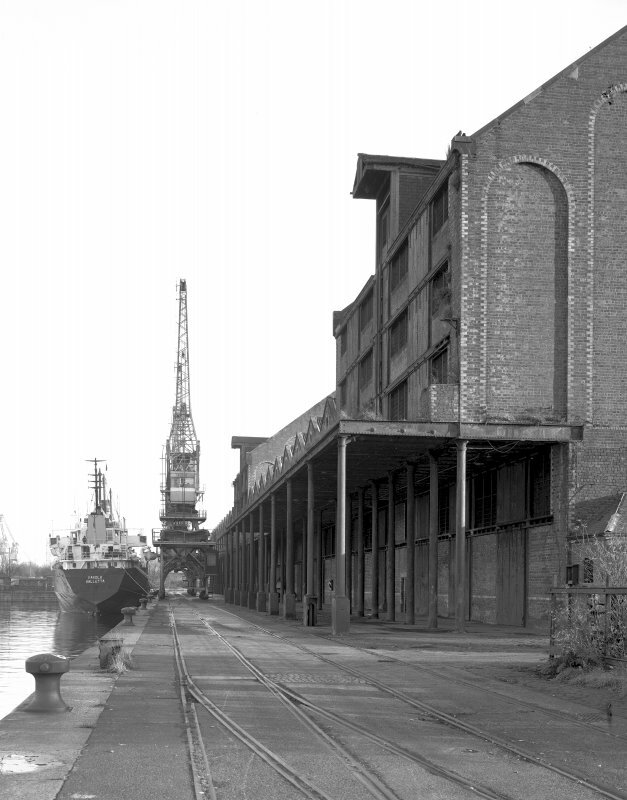 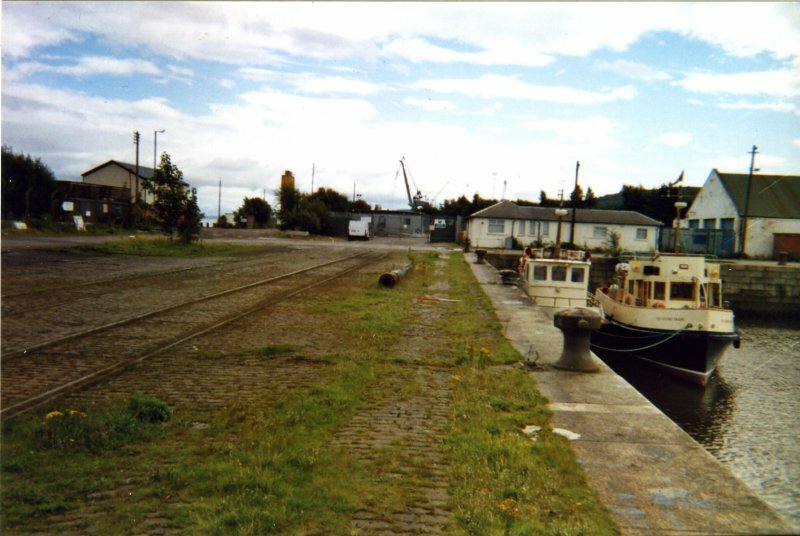 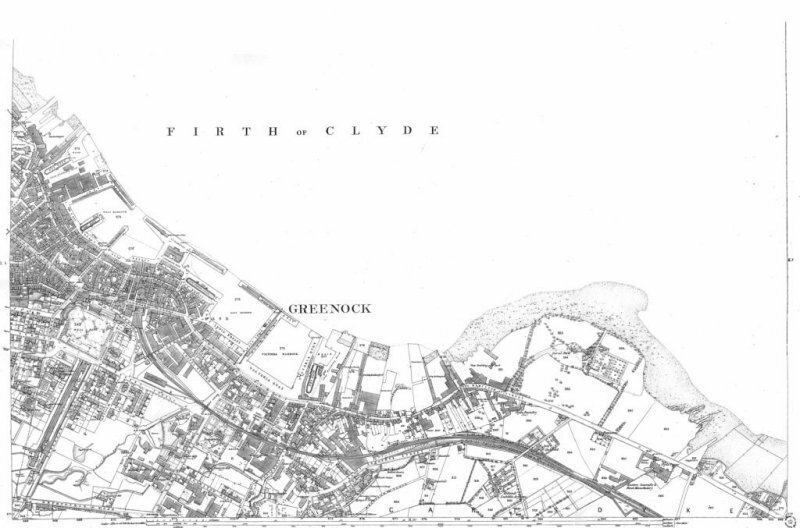 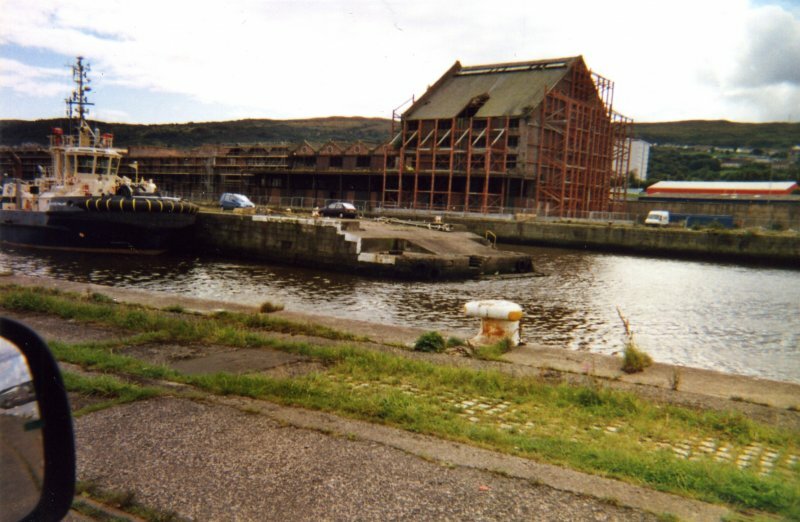 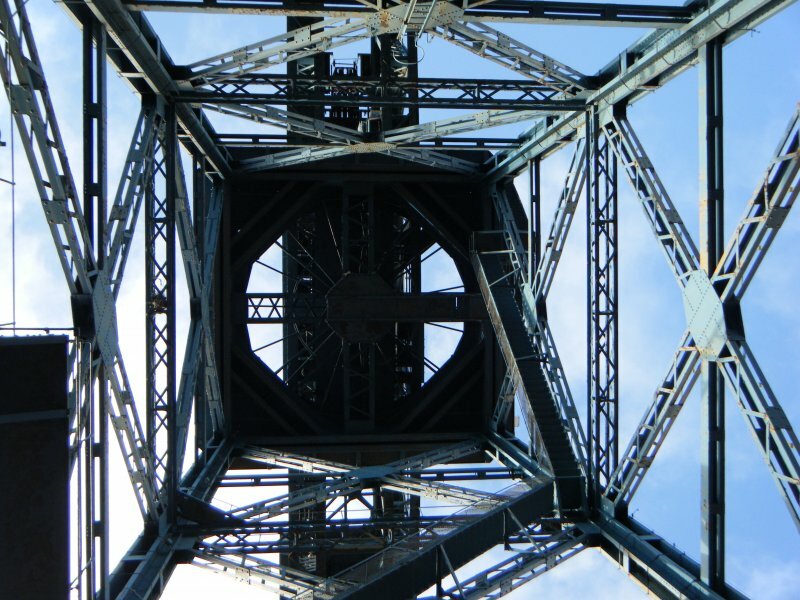 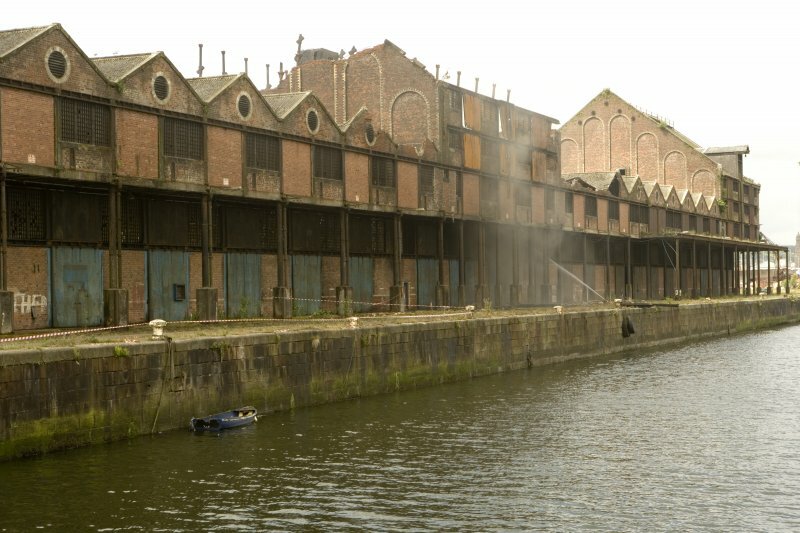 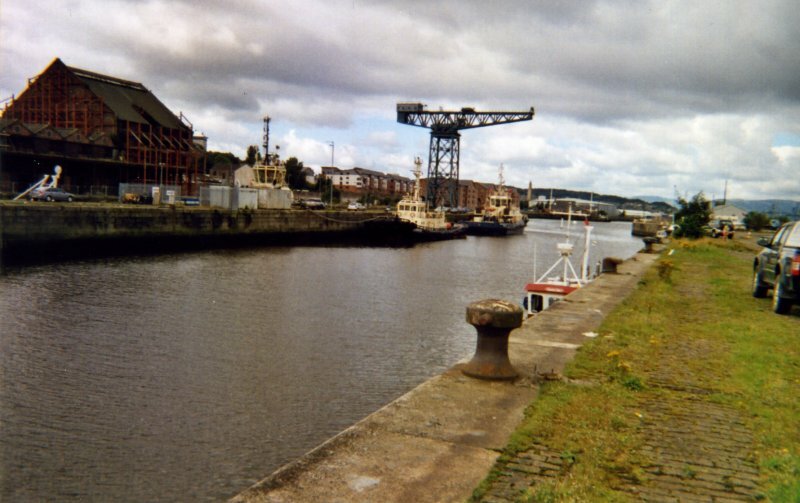 James Watt Dock [NS27NE 17.00], 1879-86, engineer W R Kinipple. 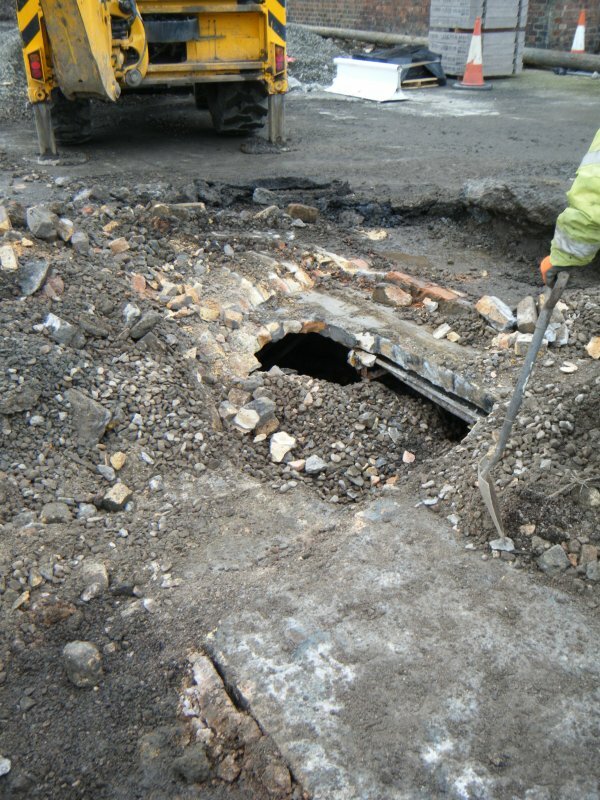 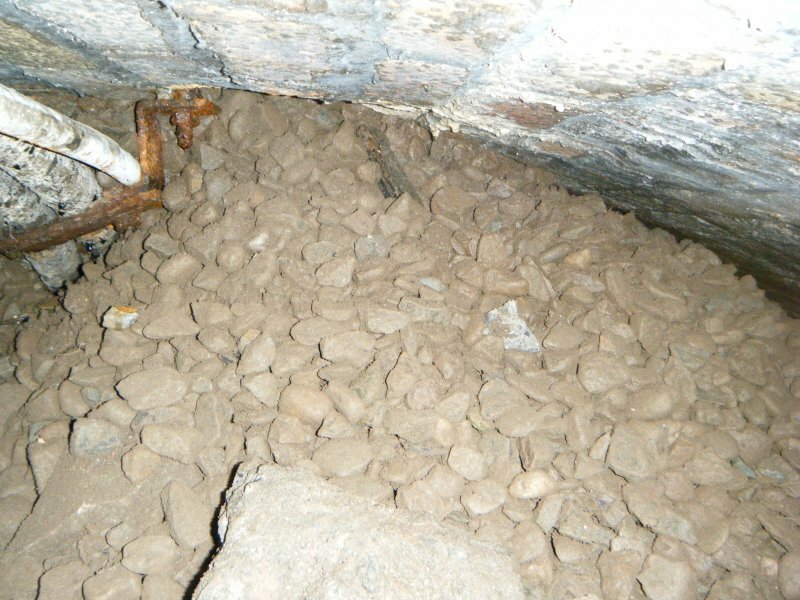 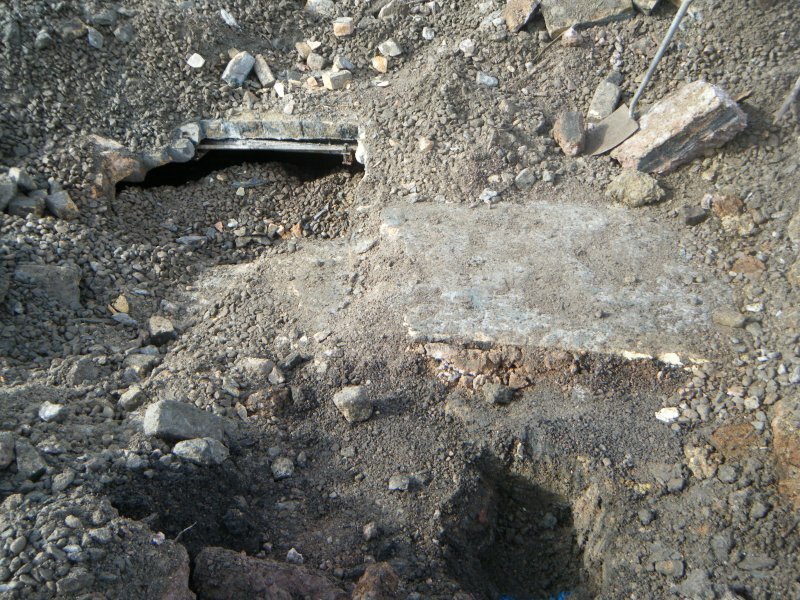 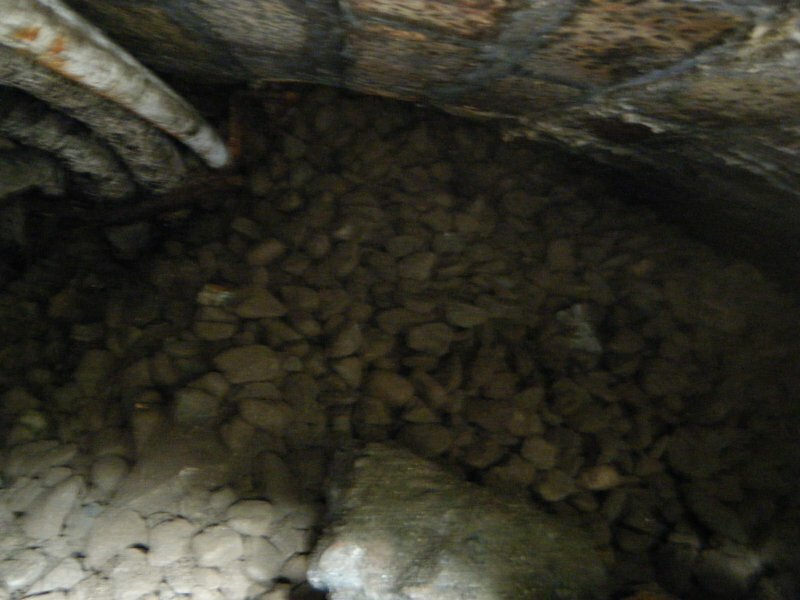 A roughly rectangular gated basin, with a short pier at the E end giving additional berthage. 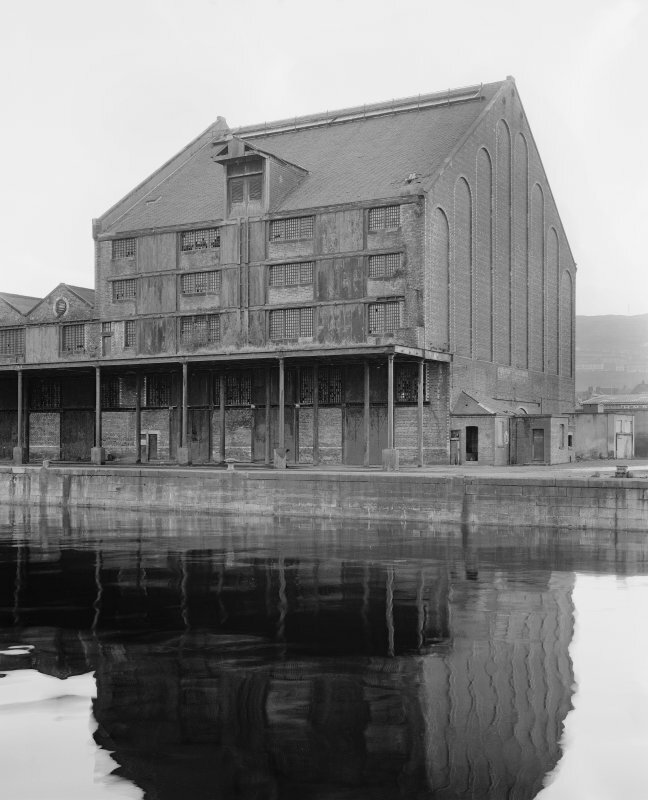 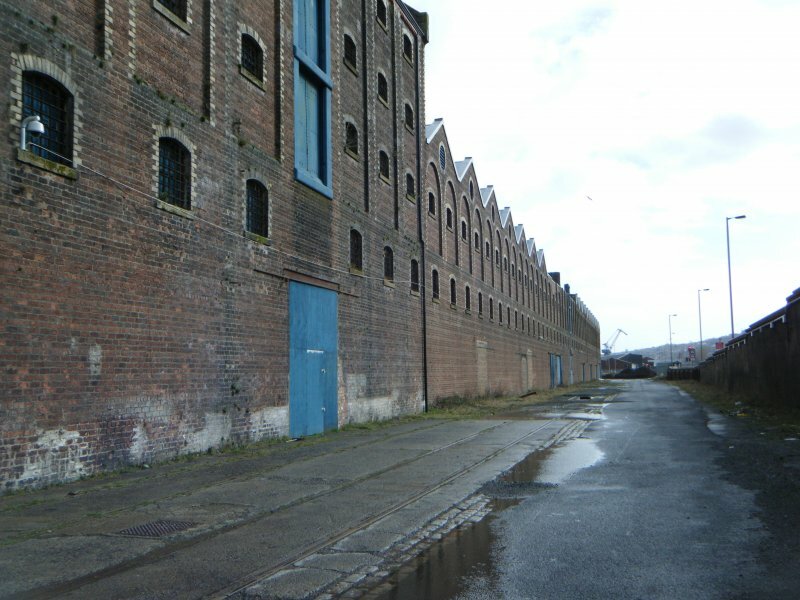 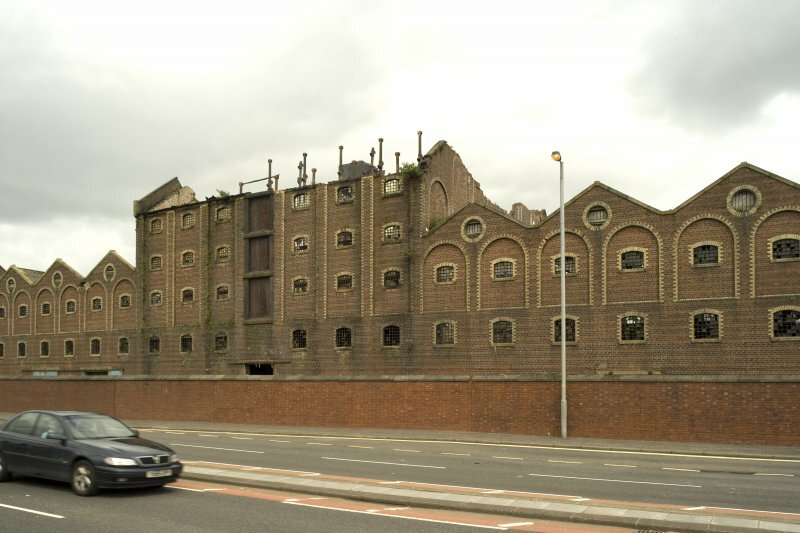 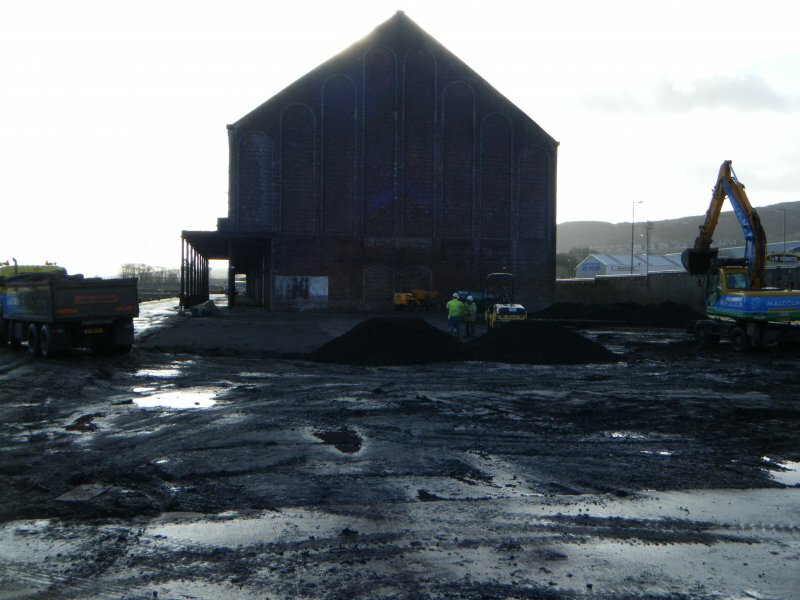 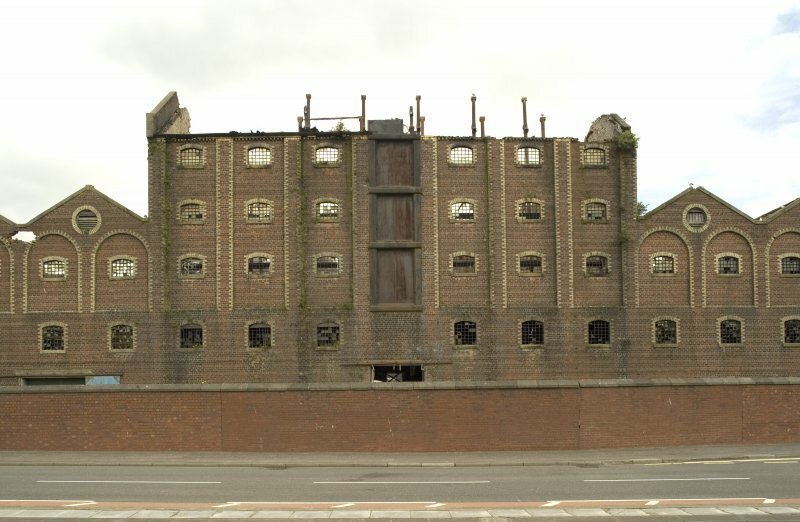 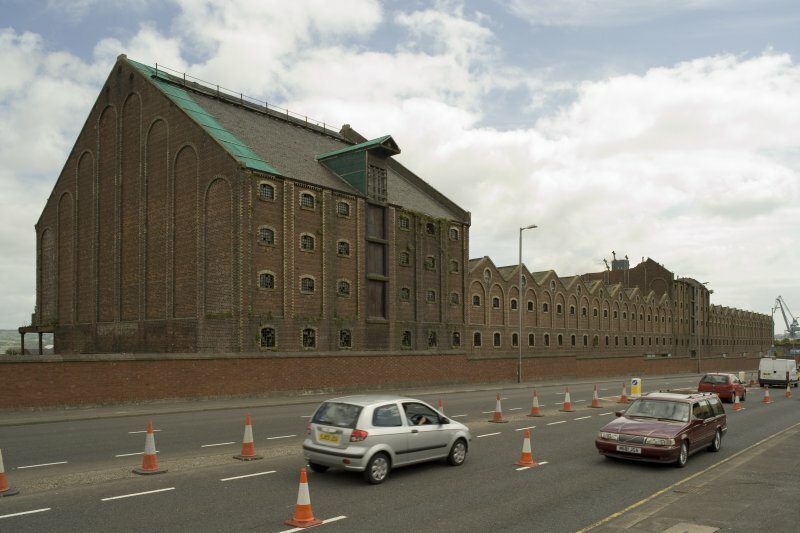 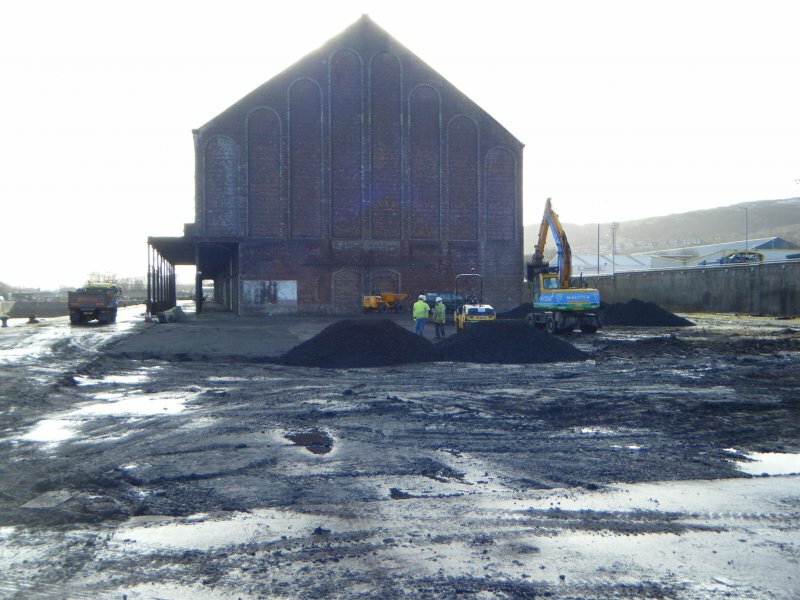 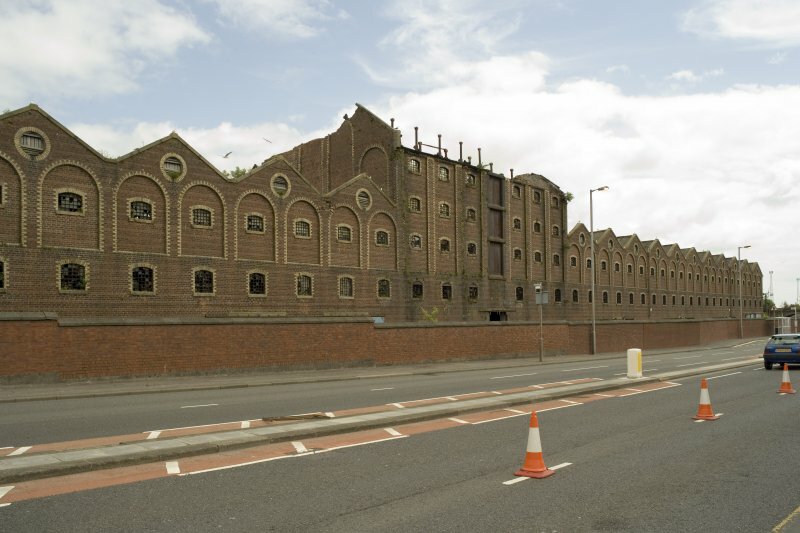 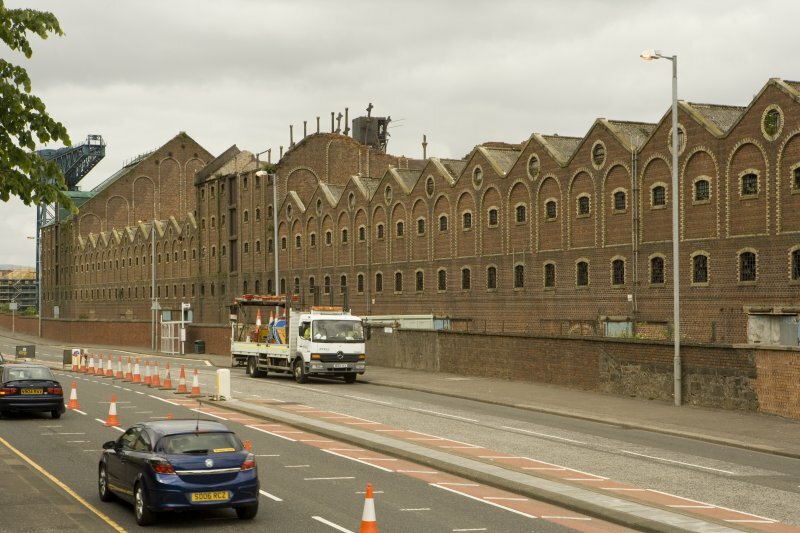 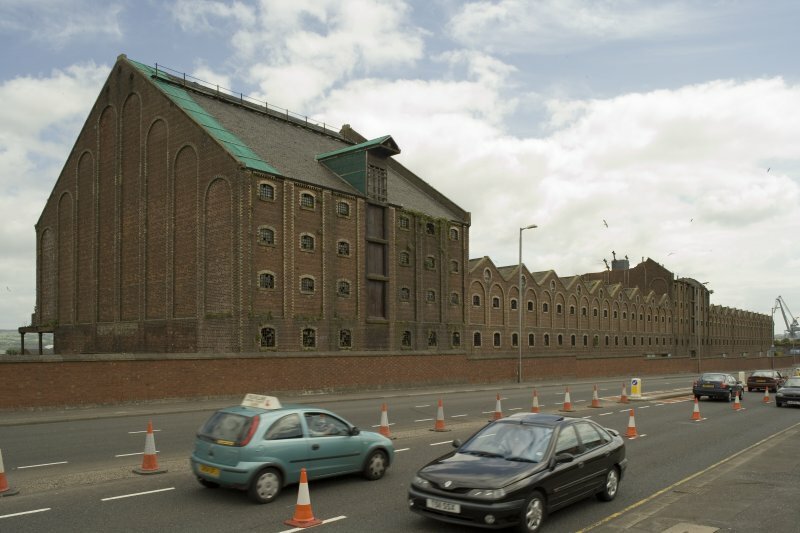 This raw sugar warehouse (c. 1885) is now disused.